Kure castle (久礼城) is built over the hill of about 100 meter height from hillside at the center of current Kure town. 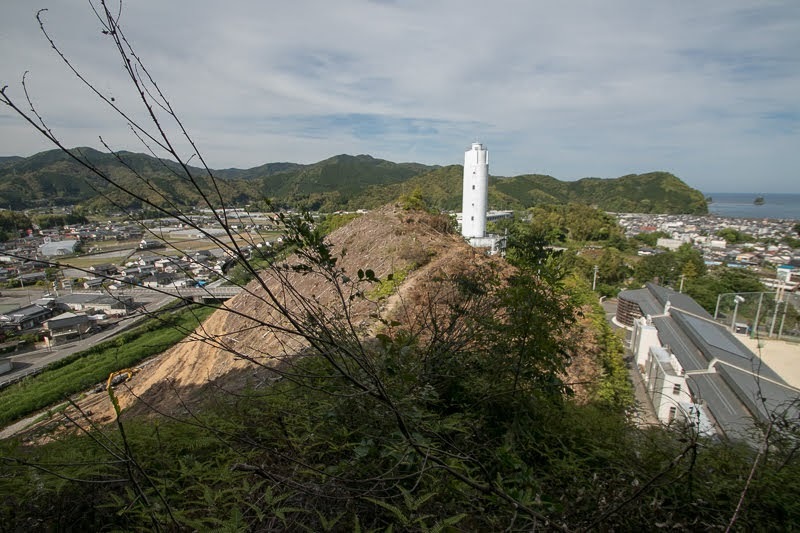 Kure town is a small port town at the mouth of Kure-gawa river, Kure town prospered as a port of single rod fishing of Bonito, and also loading port of woods produced around the mountain of Shimanto area. 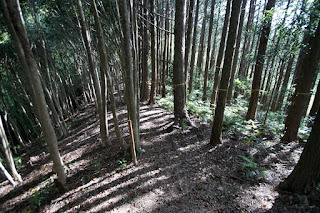 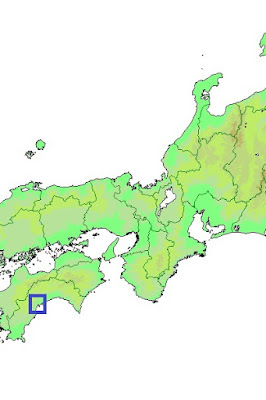 Kure area exists at the western edge of flat area of middle part of current Kochi prefecture. 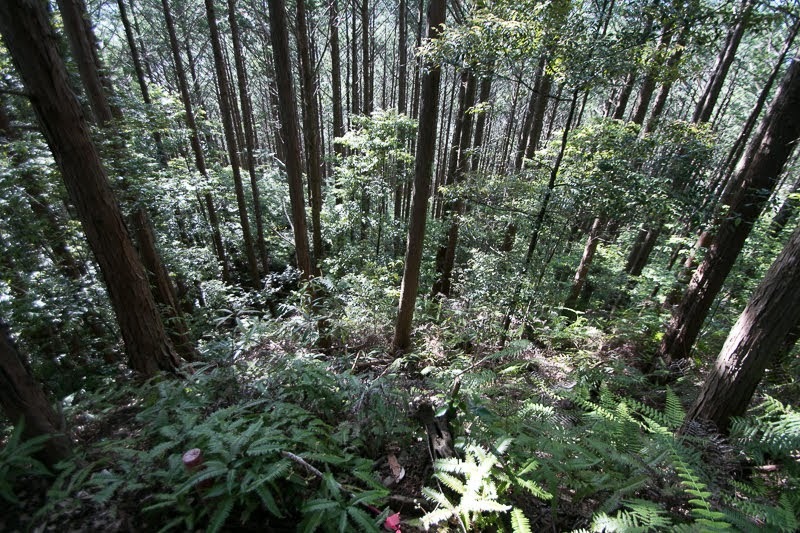 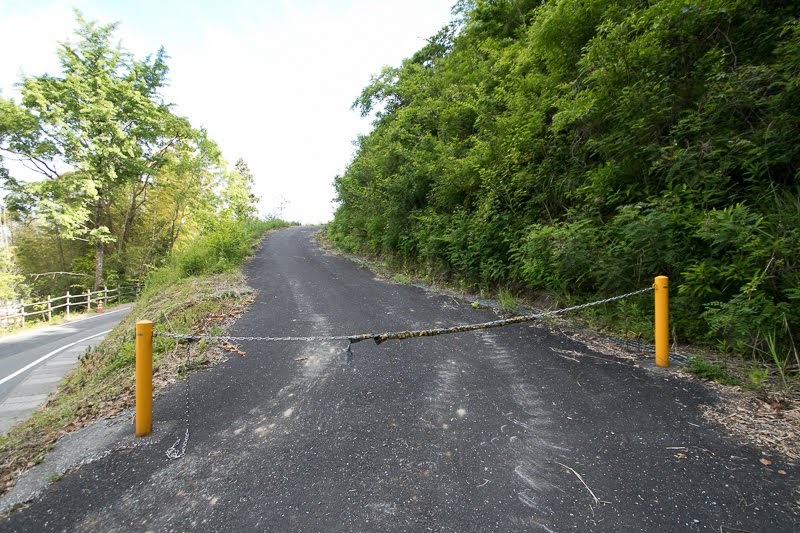 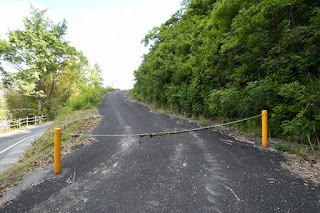 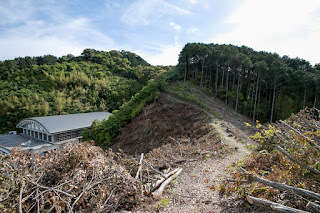 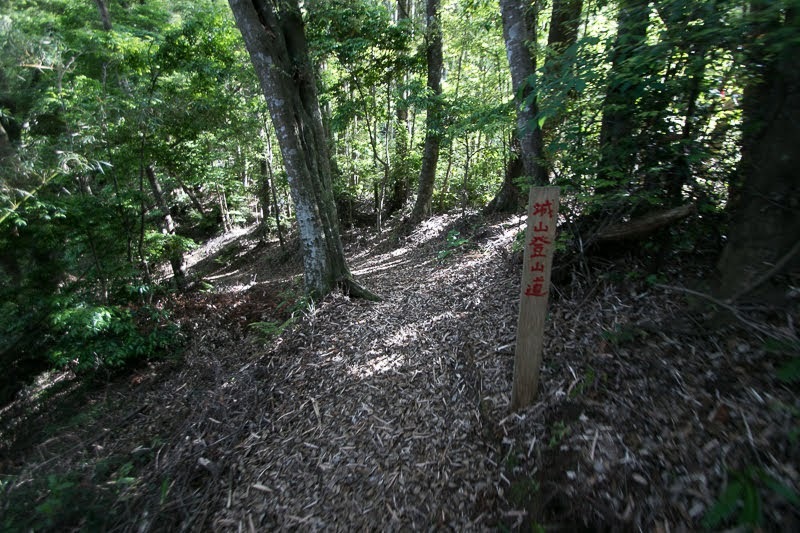 Once passing Kure area, it takes over 50 kilometer mountainous road to arrive at Nakamura plain, the second largest on at the western part of the prefecture. 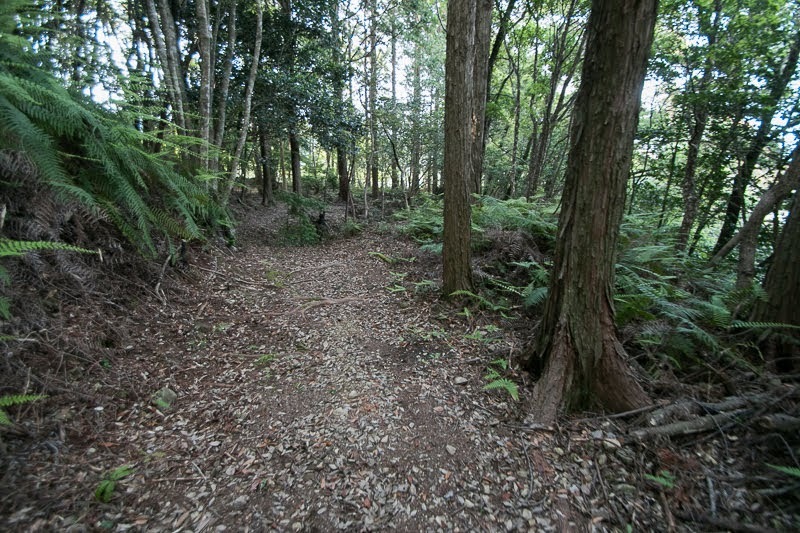 For both of Kochi plain and Nakamura plain, Kure area has been an entrance to another. 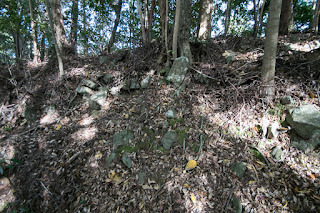 Precise year is not known but Kure castle might be built by local lord Satake clan in 14th century. 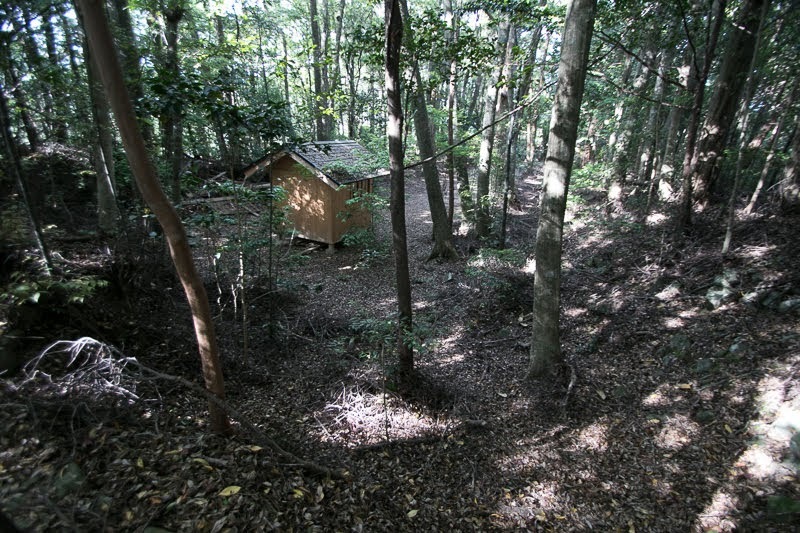 Satake clan was a branch family of main family at Hitachi province (Ibaraki prefecture), a distinguished family of Minamoto clan and was regarded as eight major traditional clan in Kanto region. 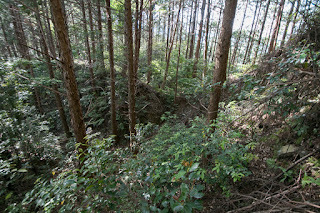 The process of arrival of Satake clan to Kure area is also not clear, but they might be appointed as the lord of Kure providence among the confusion after the fall of Kamakura Shogunate and conflict between the North Court and South Court. 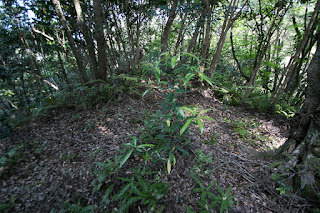 Apart from the political turbulence at central area, Satake clan at Kure area gradually grew to the major local lord. 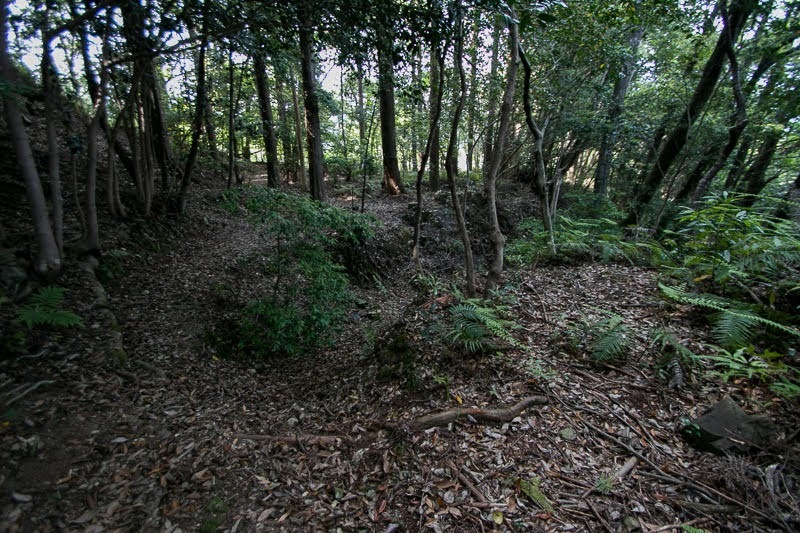 During Muromachi era Tosa province had been controlled by Hosokawa clan, the relative and highest retainer of Muromachi Shogunate. 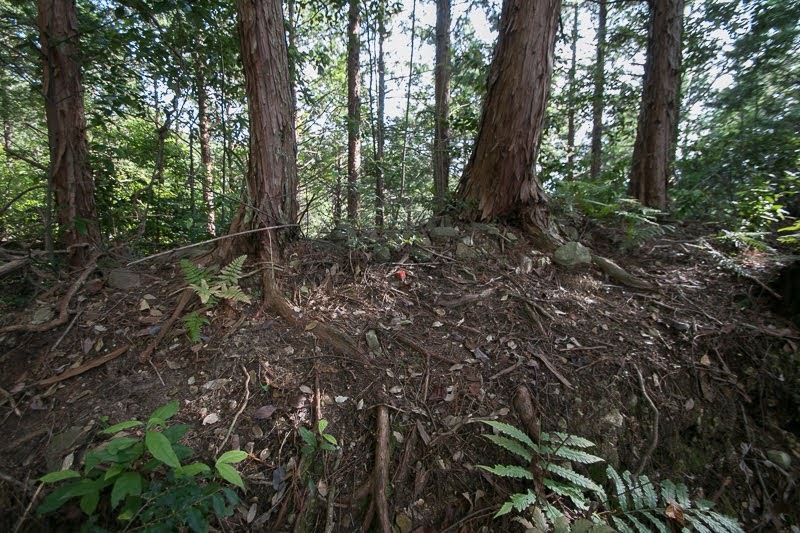 But Hosokawa clan once seized the power of Shogunate around 1500 suddenly collapsed by internal conflict then retreated from Tosa providence. 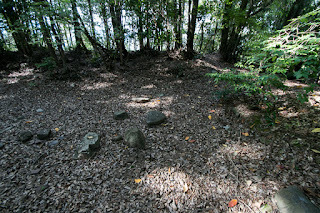 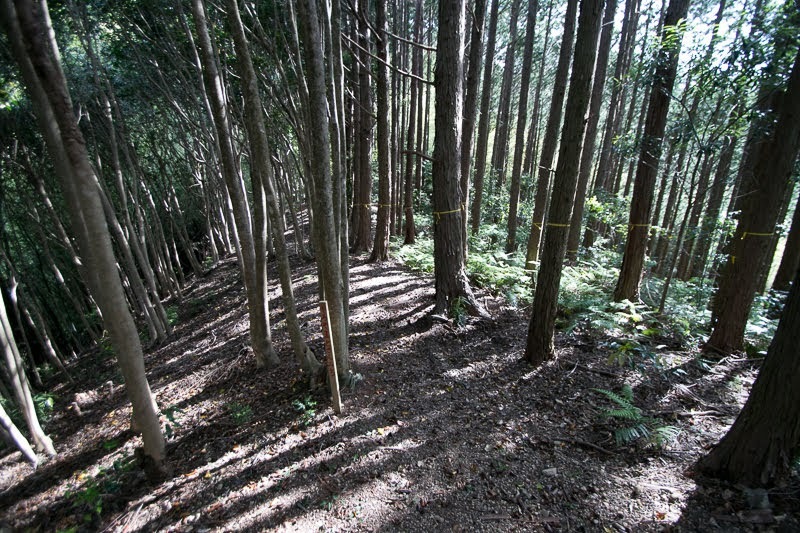 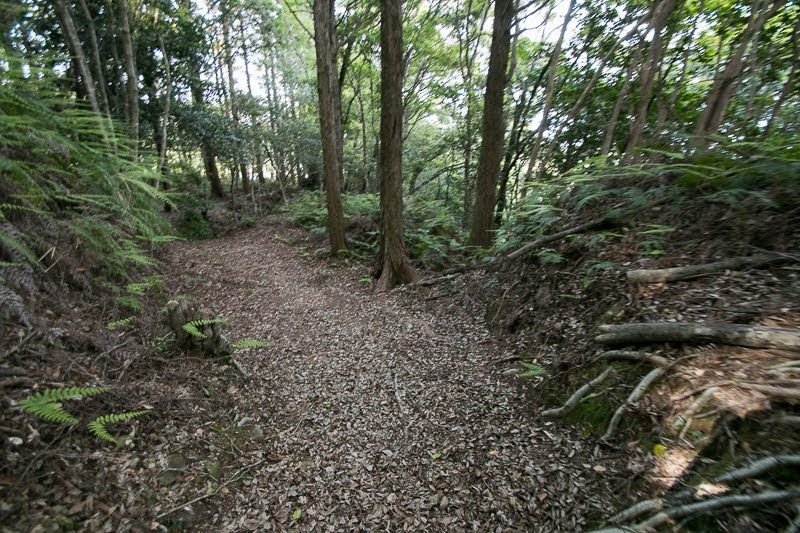 After the retreat of Hosokawa clan, Tosa province was divided among seven major local lords. 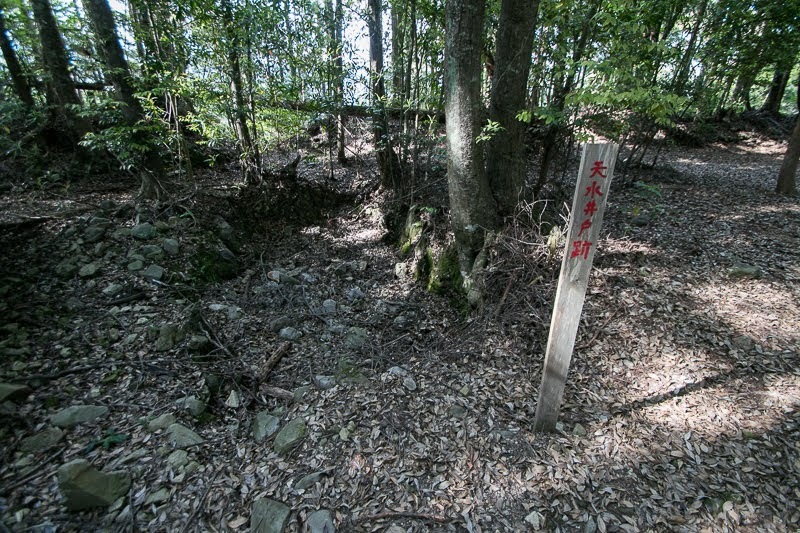 Ichijo clan, which was the tributary of highest class central noble and lord of Nakamura plain, was a prominent leader among these seven clans from its economic power and authority. 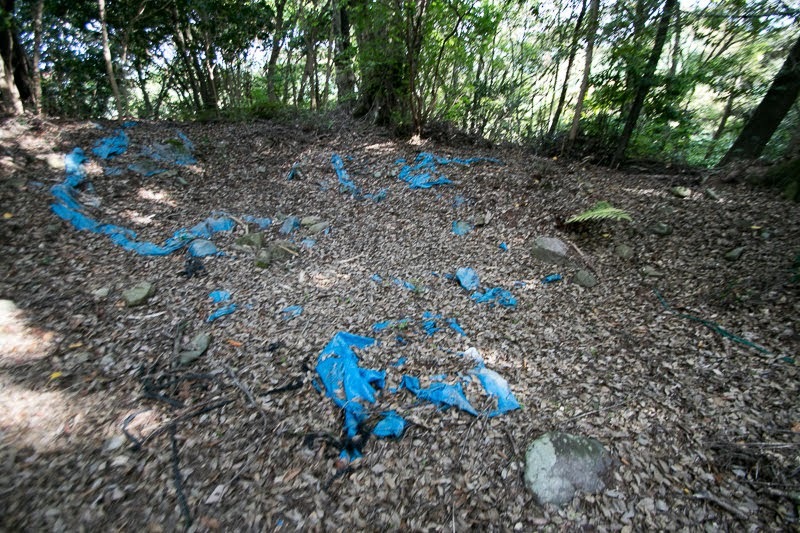 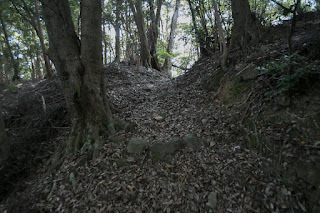 On the other hand, remaining lords such as Motoyama clan, Aki clan or Chosokabe clan were small dividing Tosa plain. 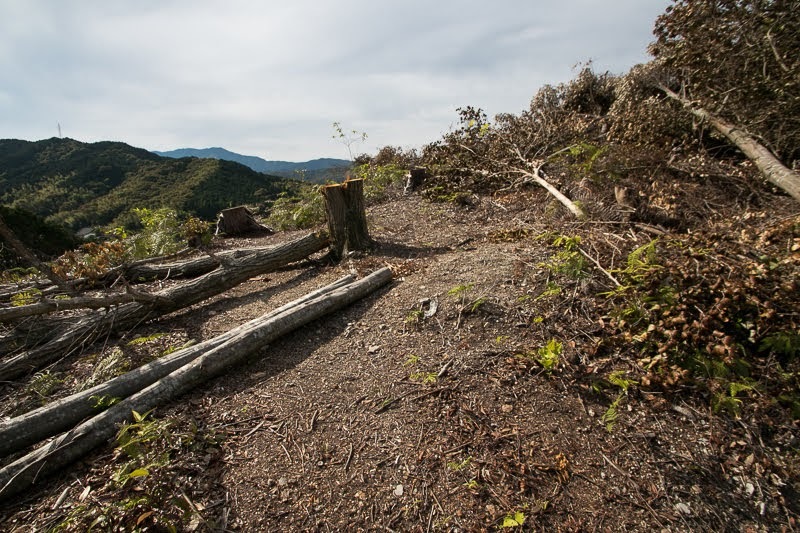 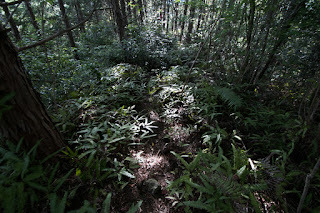 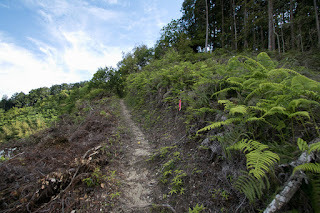 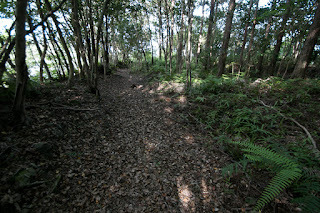 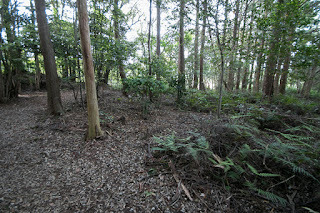 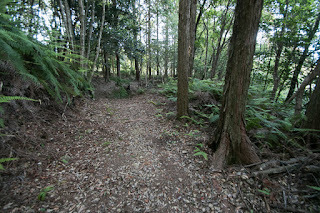 However, once Tosa plain was unified, it was far stronger than Nakamura plain. 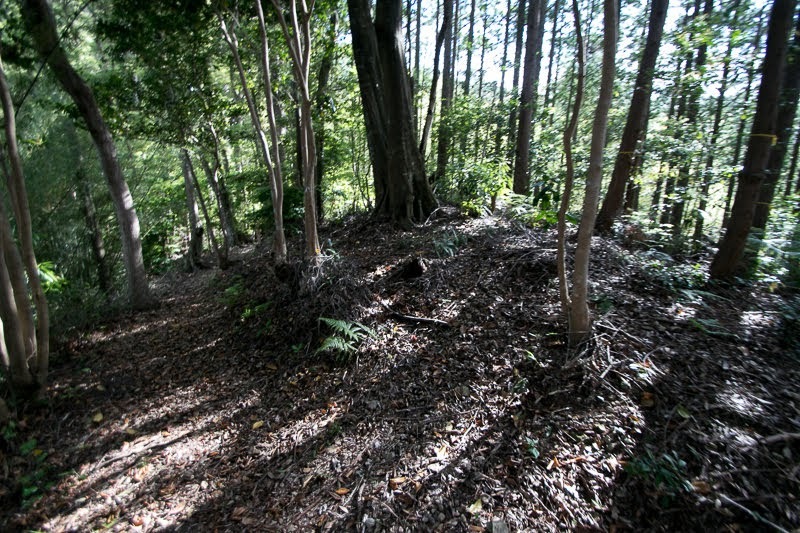 Because of the geographical closeness to Nakamura plain, Satake clan worked for Tosa Ichijo clan and became its important retainer. 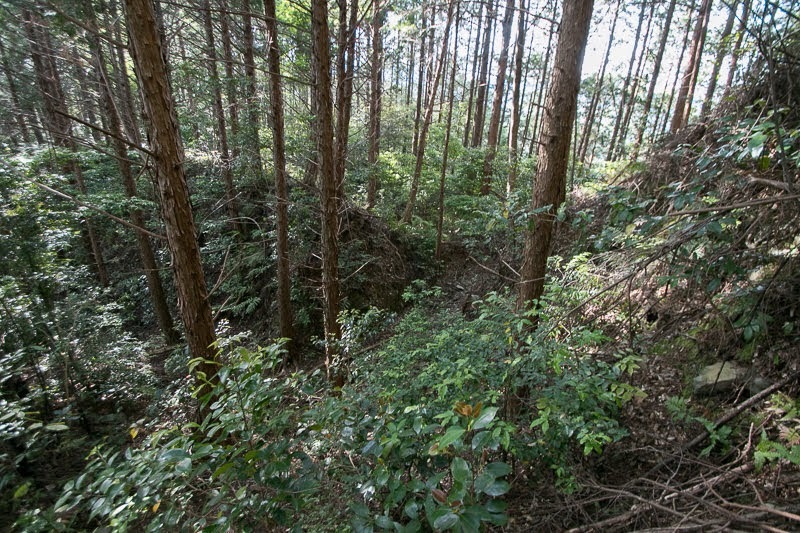 Tosa Ichijo clan experienced its peak under Fusamoto Ichijo (1522-1549), who broke Tsuno clan or Ohira clan and proceeded into the western part of Tosa plain. 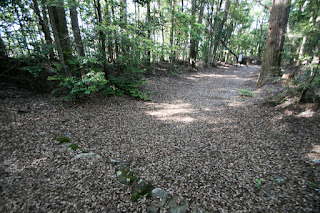 Kure castle might be used as a bridgehead of Ichijo clan at this time. However, under next leader Kanesada Ichijo (1543-1585), Ichijo clan allied with Otomo clan the warlord of Bungo province (Oita prefecture), and aggressively marched toward Iyo province. 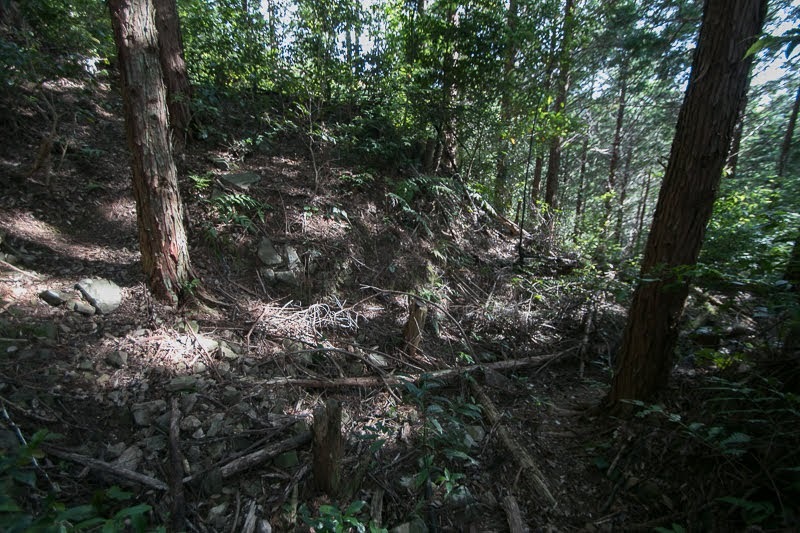 But Kono clan requested assistance to Mouri clan, the warlord of Aki province (Hiroshima prefecture) and the fatal rival of Otomo clan. Ichijo army well fought against overwhelming Mouri army but finally lost the battle, then had to retreat to Tosa province. After this battle Ichijo clan lost not only their wealth and army, but also the authority to manage other six lords of the province. 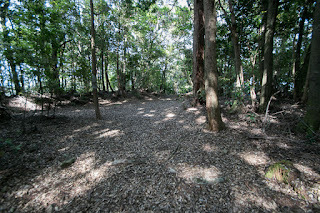 On the other hand, at Kochi plain, Motochika Chosokabe (1533-1599) beat Motoyama clan and grew to the leader of Kochi plain. 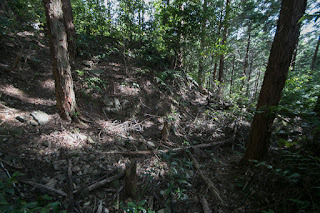 Even though, as Chosokabe clan was formerly ruined by surrounded lords and was rescued by Ichijo clan, Motochika made plots to collapse Ichijo clan internally to avoid decisive battle. 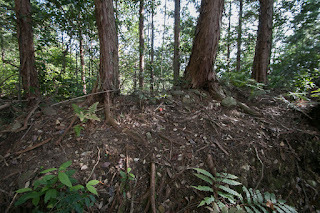 Motochika spread the rumor on betrayal of retainers of Ichijo clan, and Kanesada purged his loyal retainer Sosan Doi at last. 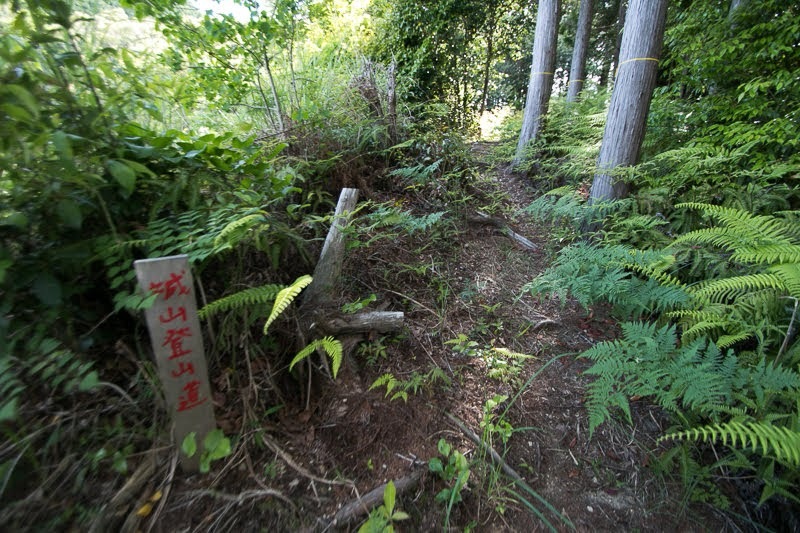 According to military tale “Nankai Chiran-Ki”, someone placed a board writing a poem ridiculing neglect of Ichijo clan to Aki clan and next target was Satake clan. 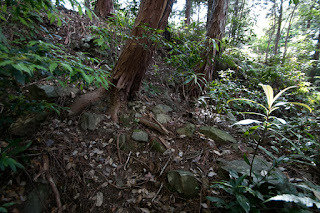 Satake clan asked assistance to Ichijo clan but there was no response, thus Satake clan finally decided to turn to Chosokabe clan, When Motochika encircled Kure castle in 1570, Satake clan nominally fought to show their duty to Ichijo clan but soon surrendered to Motochika as agreed. 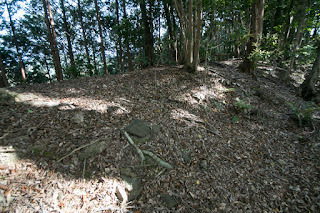 After the turn of Satake clan, Motochika attacked surrounding castles such as Hasuike castle or Hewa castle then placed his relative as the commander of such clan. 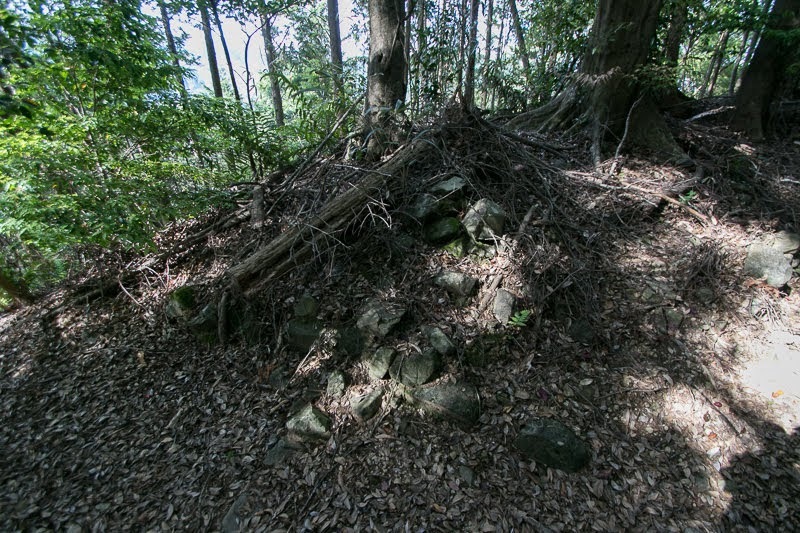 At this time Satake clan became a marital relative of Chosokabe clan, and their main base Kure castle was renovated by the technology of Chosokabe clan as a front side fort toward Ichojo clan. 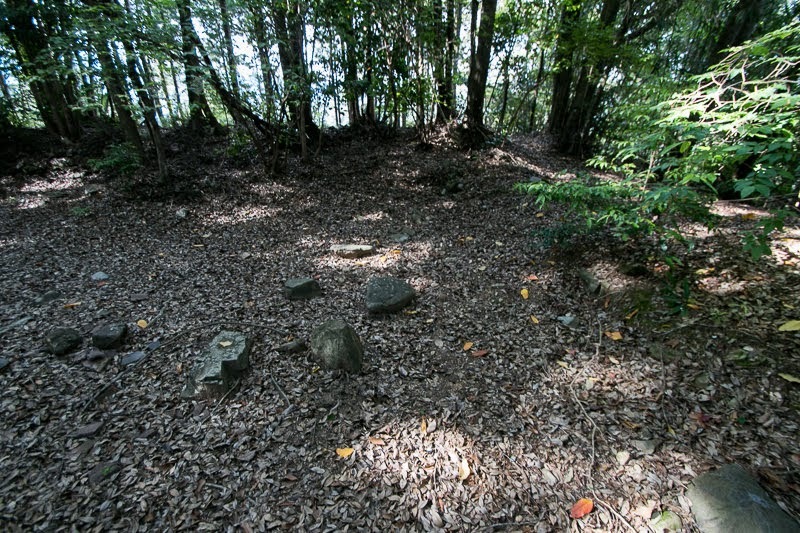 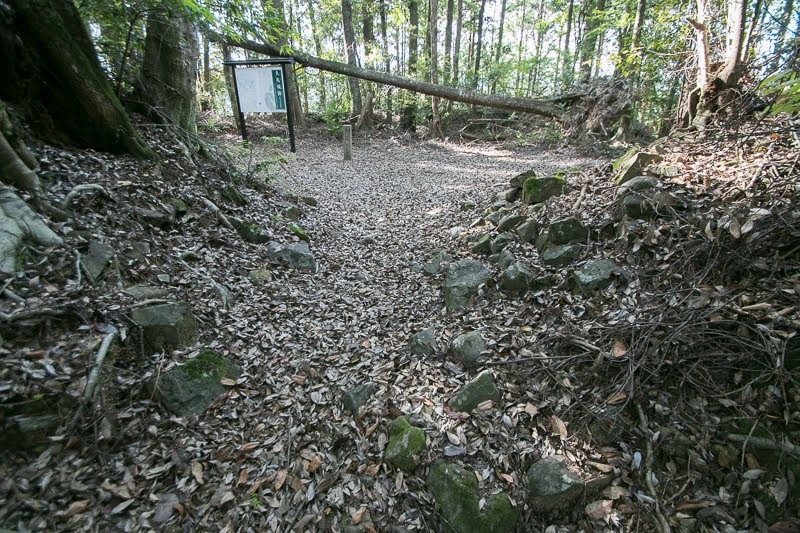 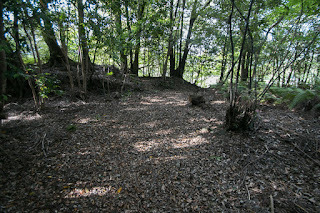 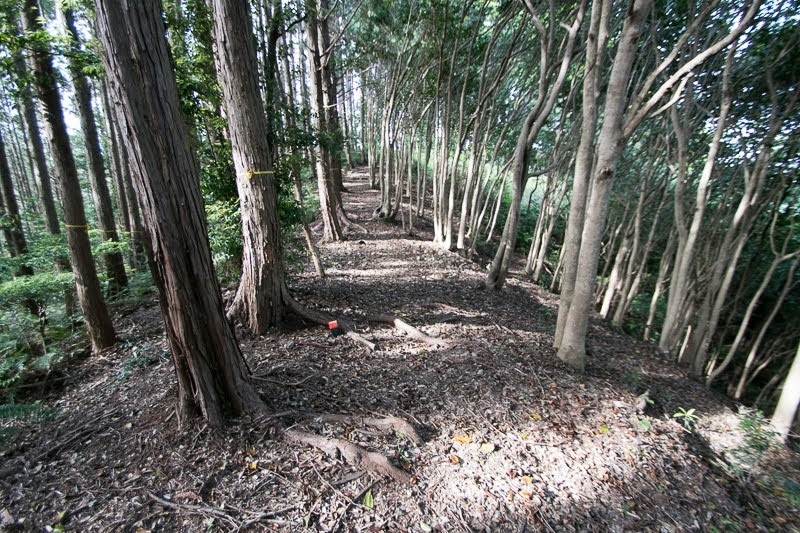 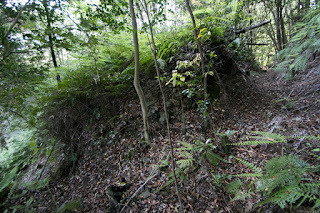 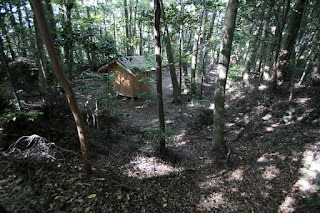 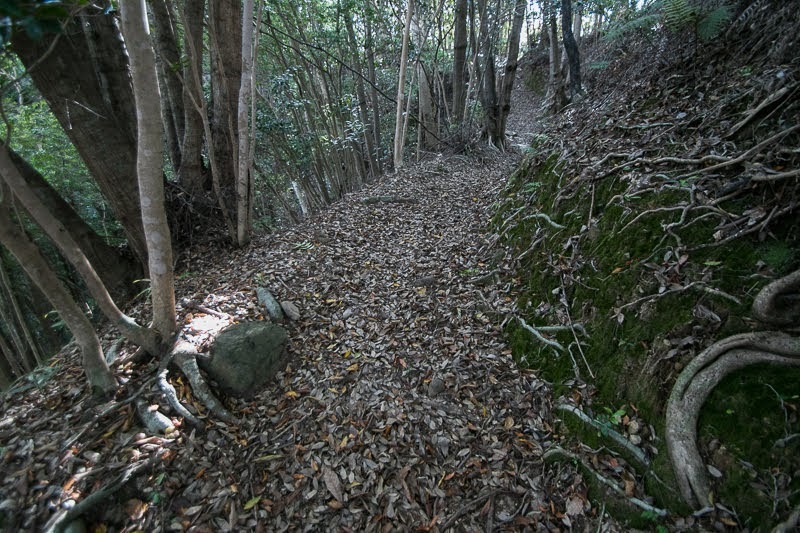 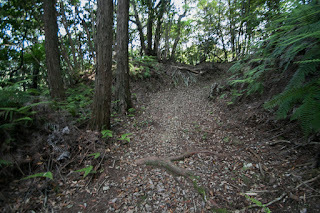 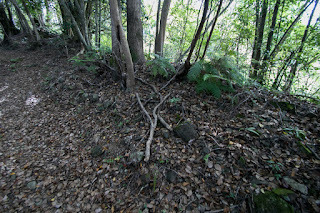 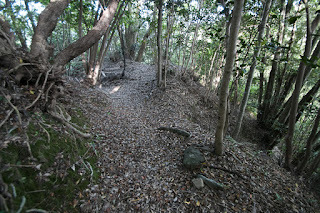 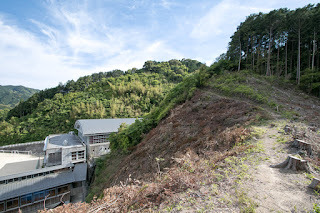 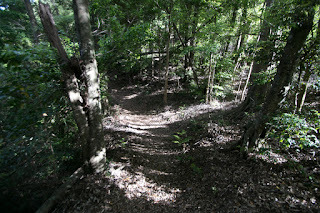 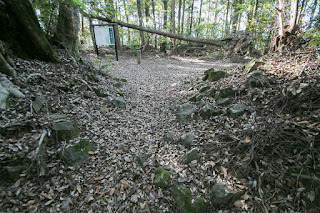 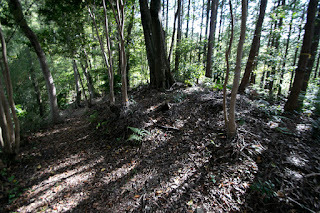 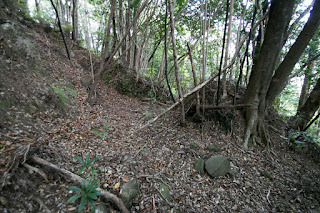 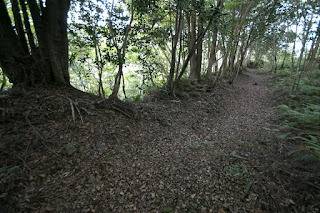 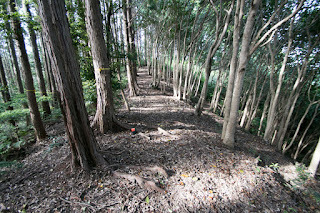 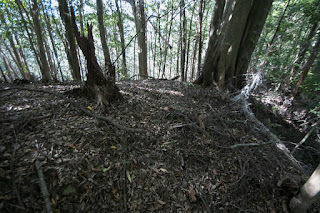 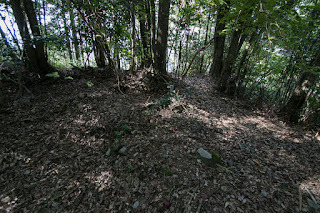 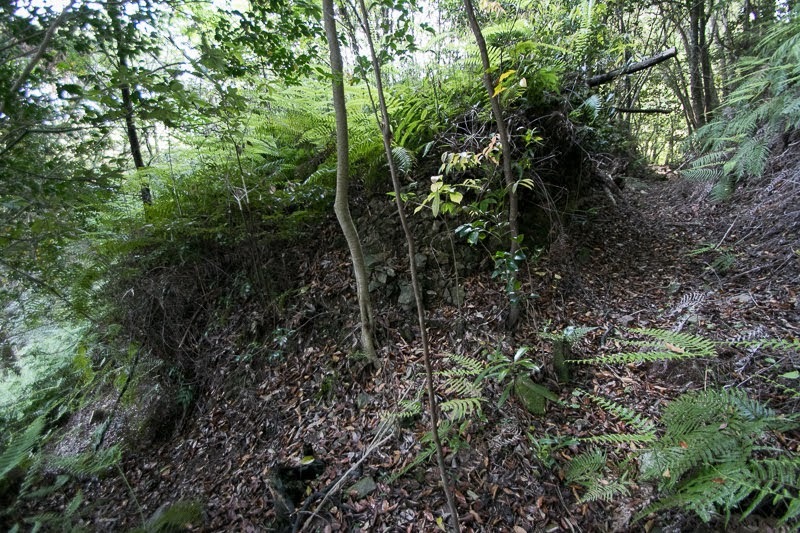 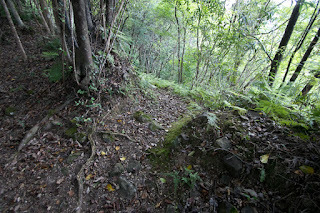 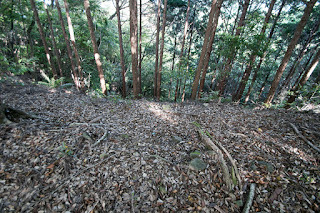 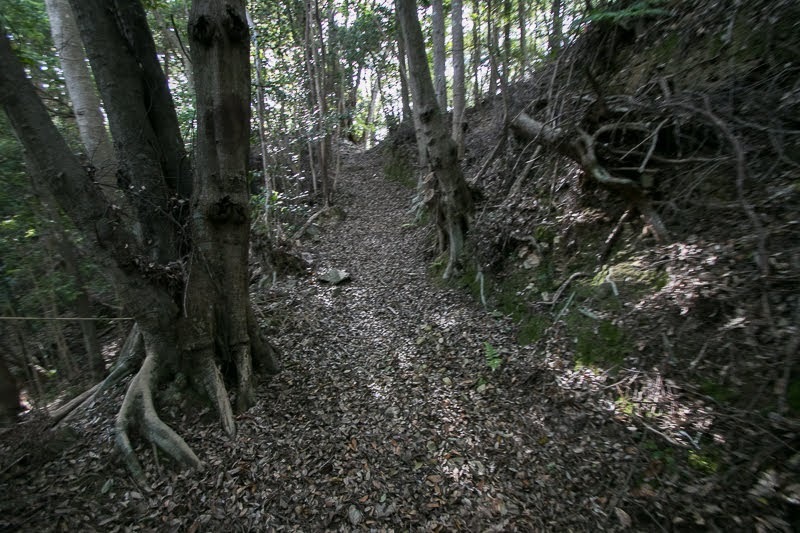 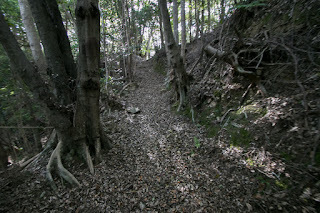 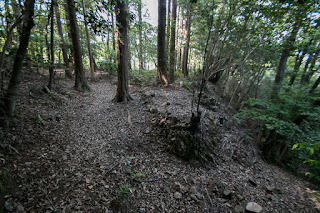 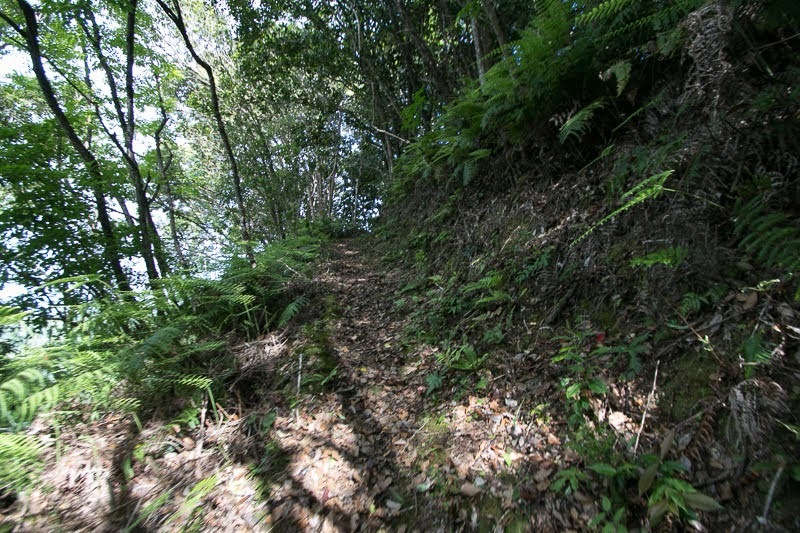 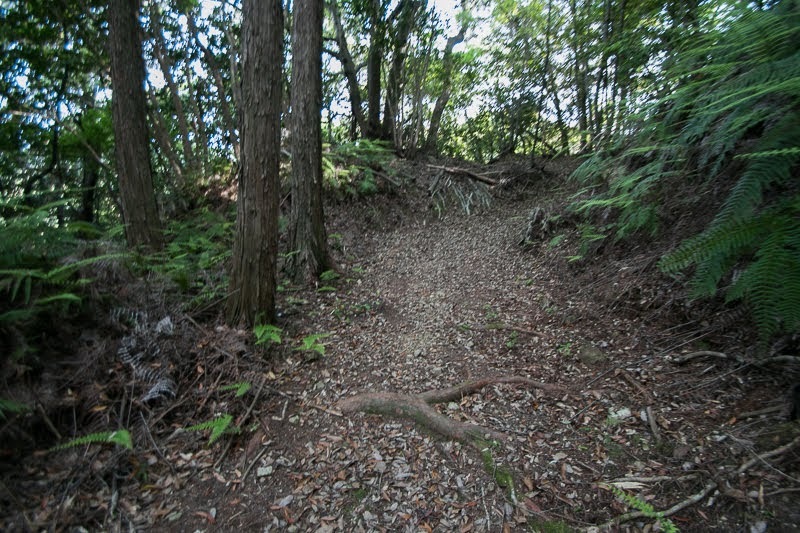 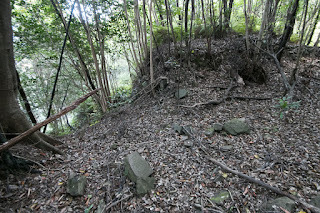 Kure castle is built over a small hill of about 300 meter long only connected by narrow saddle point toward the main body of the ridge at the south. 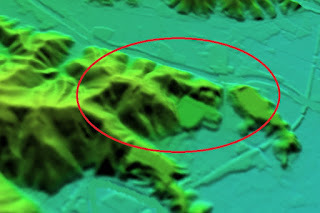 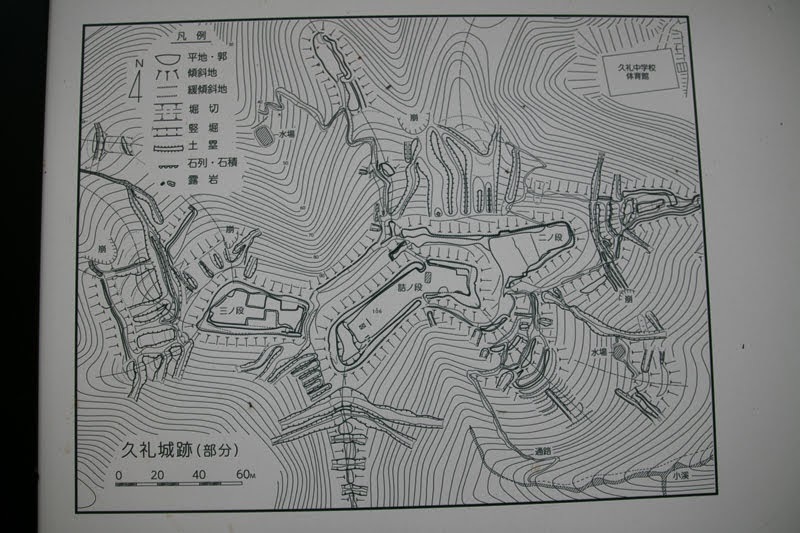 Affected by the shape of the hill, the structure of the castle roughly consist of central area, secondary area at east and third area at west placed in straight line. 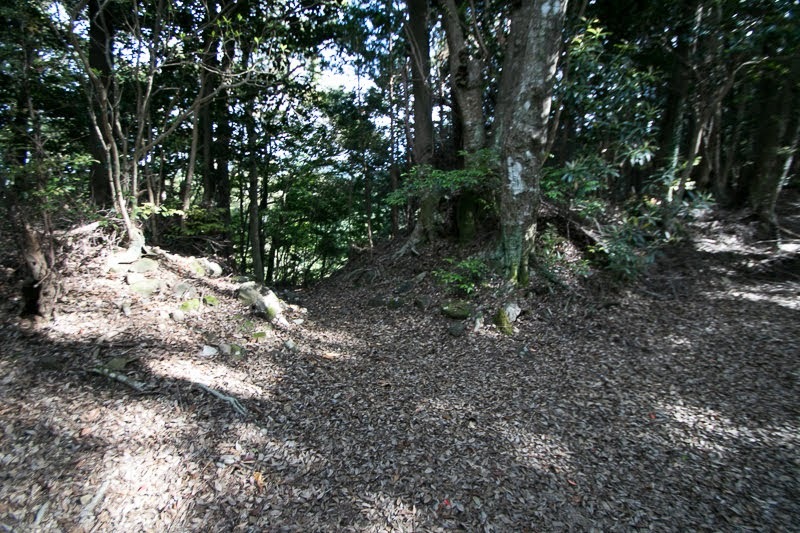 Central area of the castle is a slightly curved rectangular one of about 100 meter long and 20 meter width, now used as a ground of shrine. 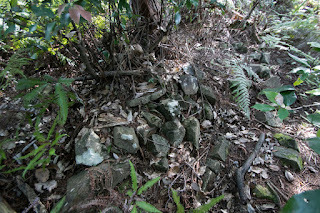 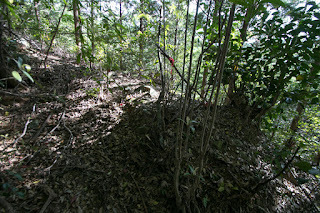 The backside of the area is protected by huge clay wall of over 10 meter width, probably a basement of main building. 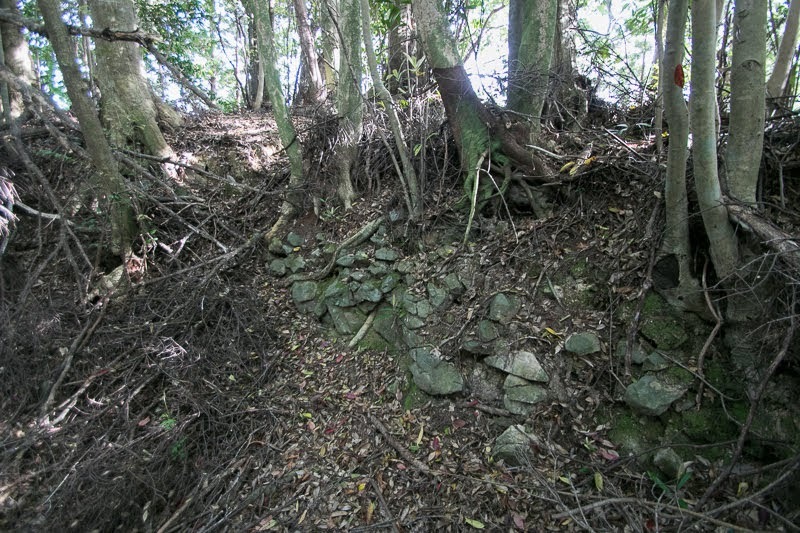 East half of the area and two gate at the middle of north and south line is protected by low height stone walls. 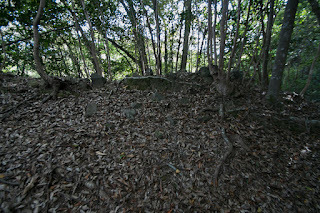 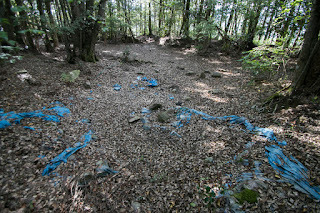 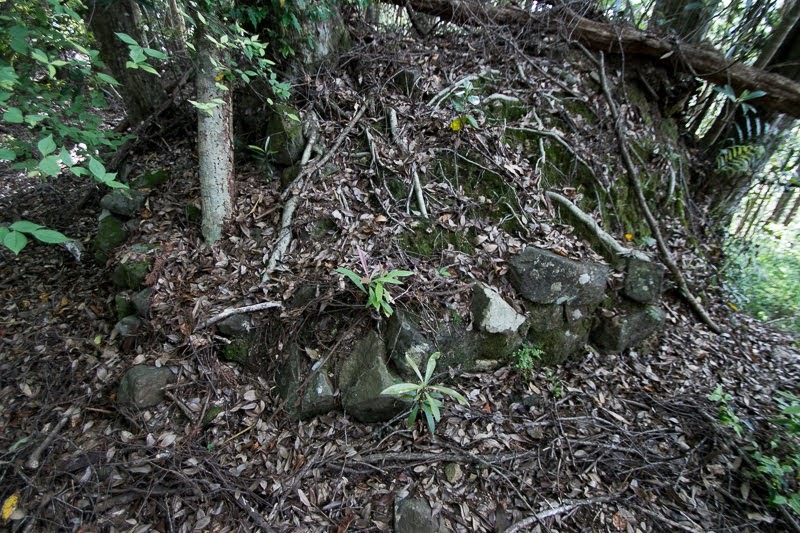 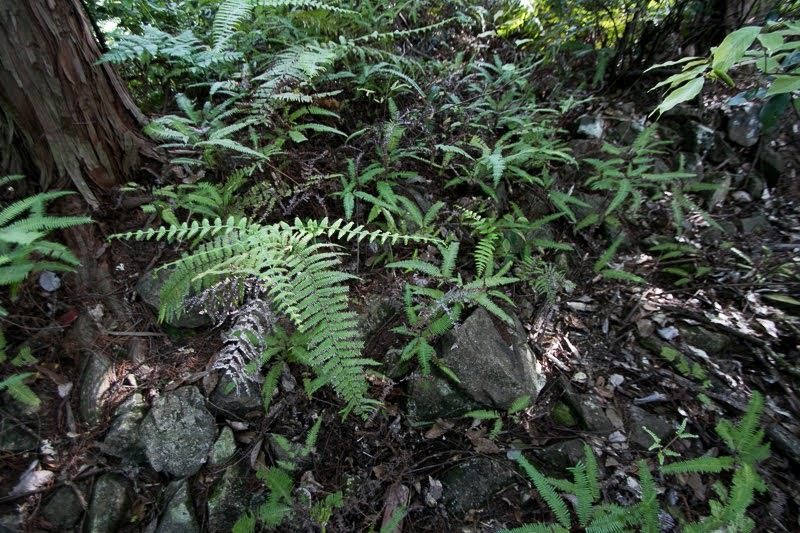 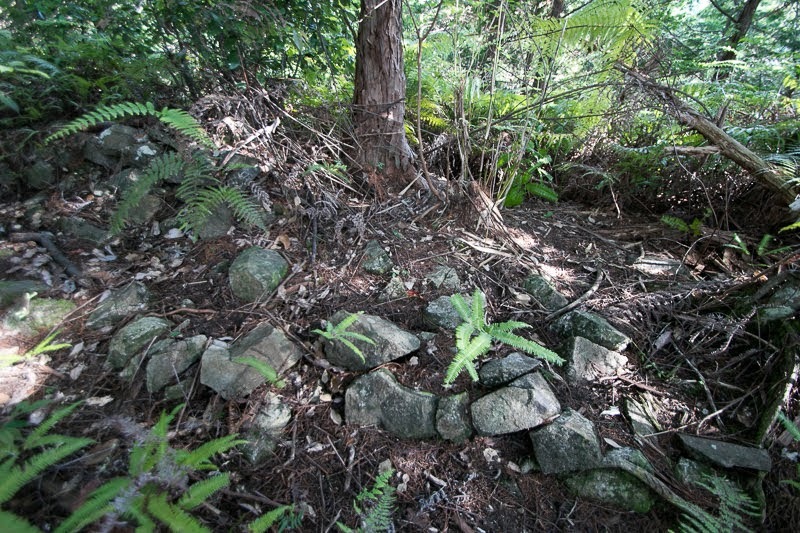 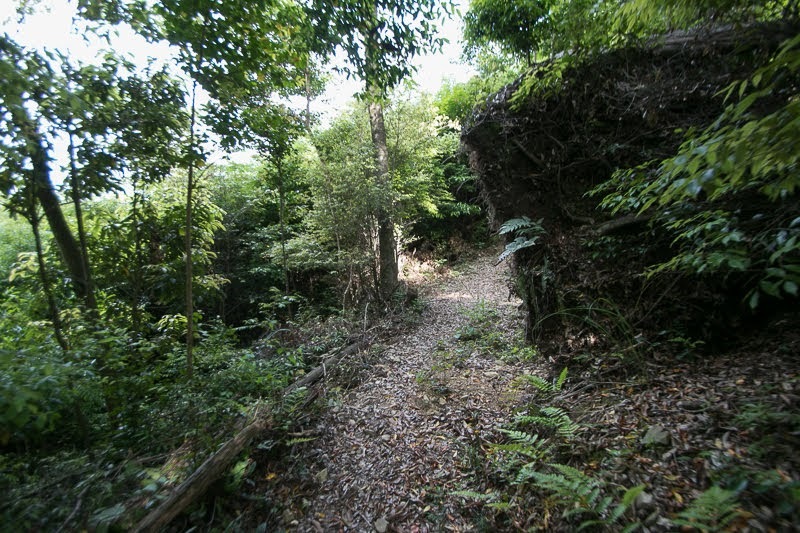 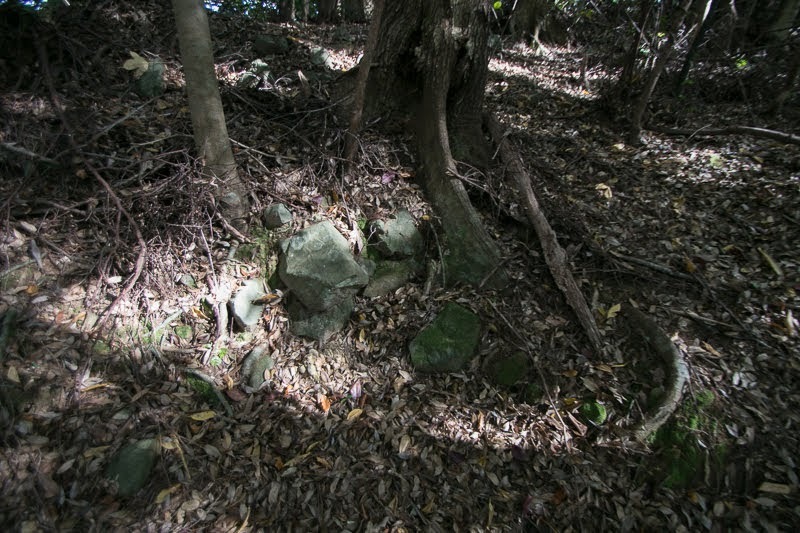 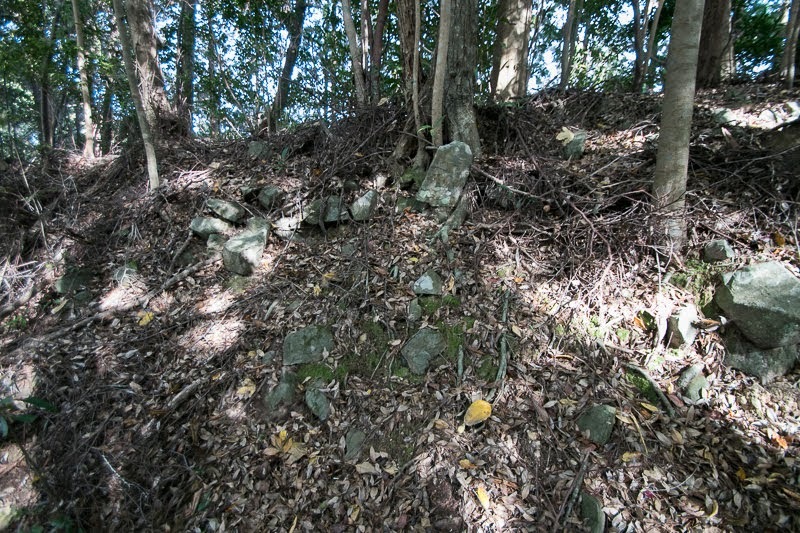 Secondary area is a rectangular one of about 50 meter long and 20 meter wide, which is also protected by low height stone wall. 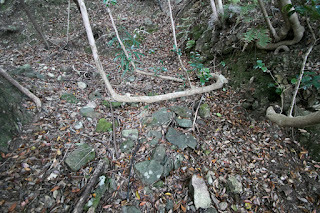 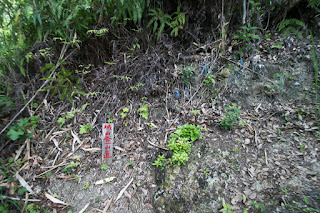 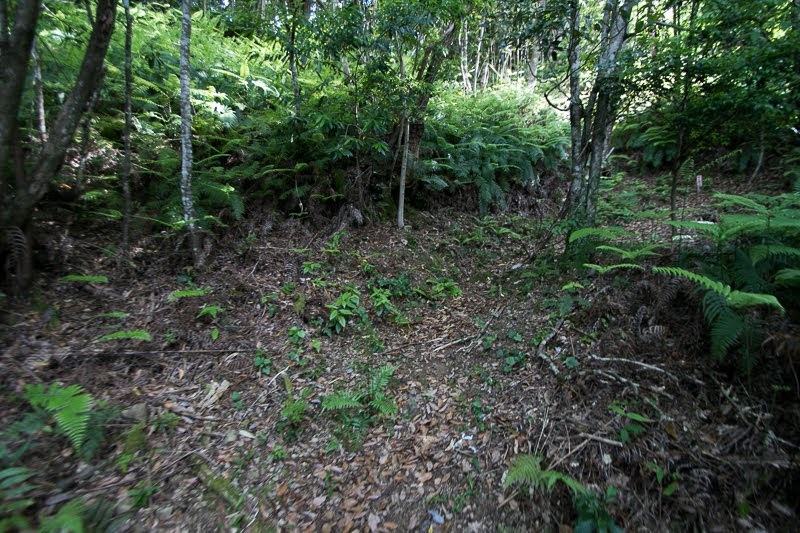 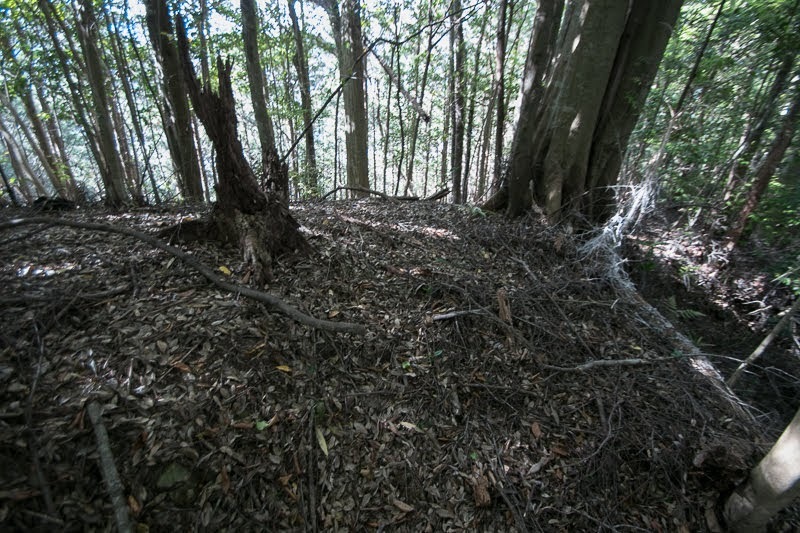 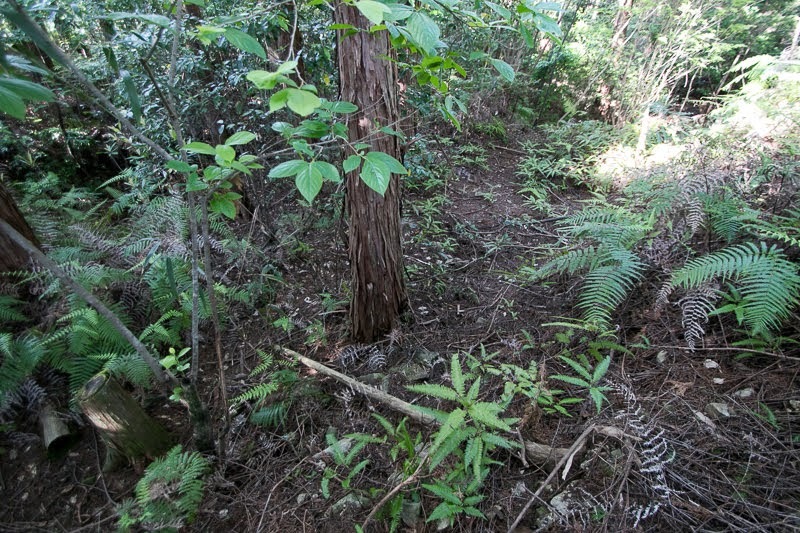 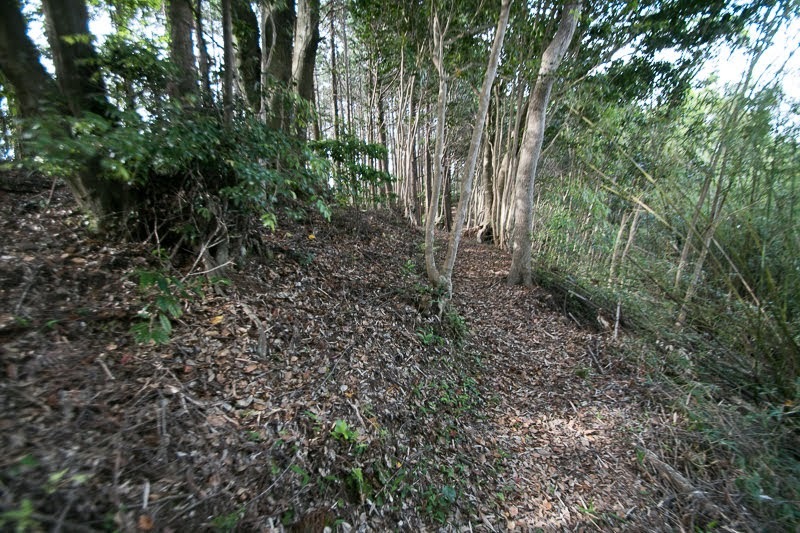 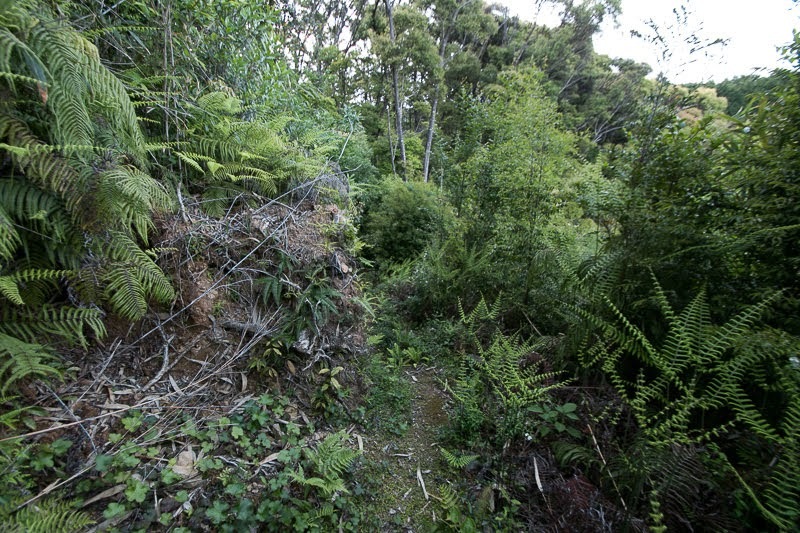 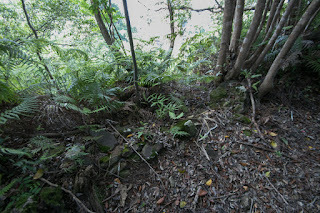 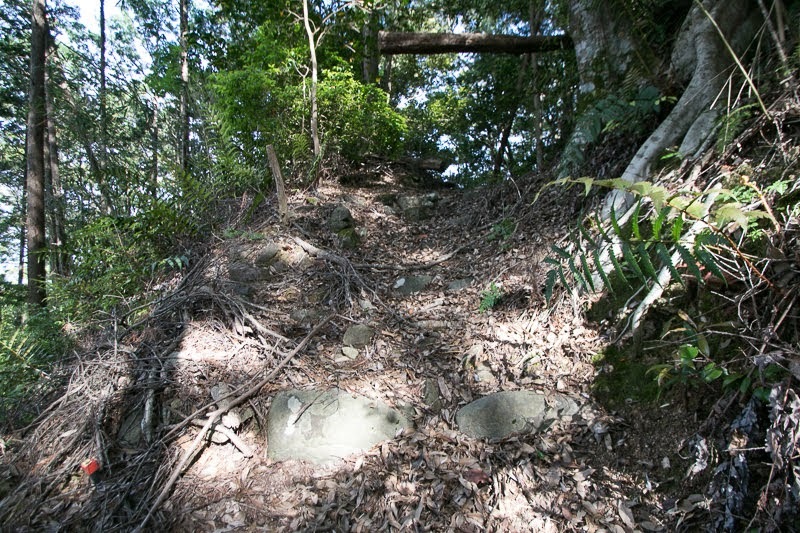 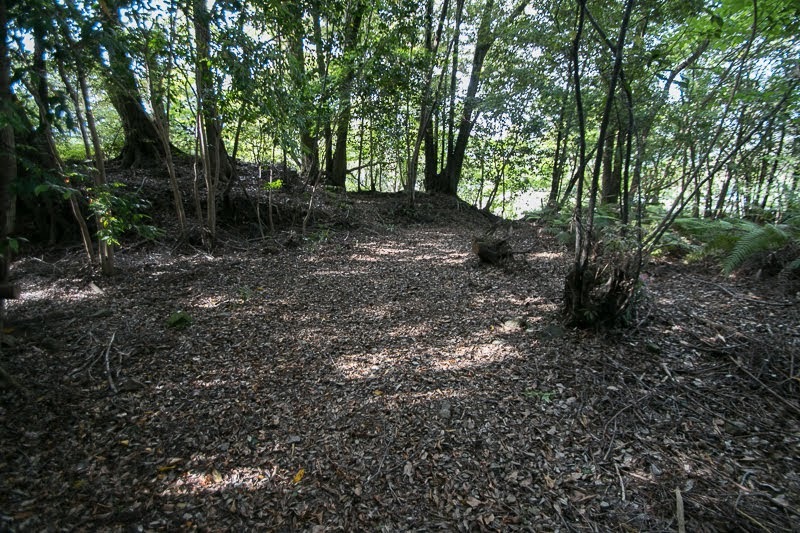 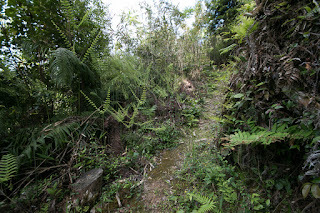 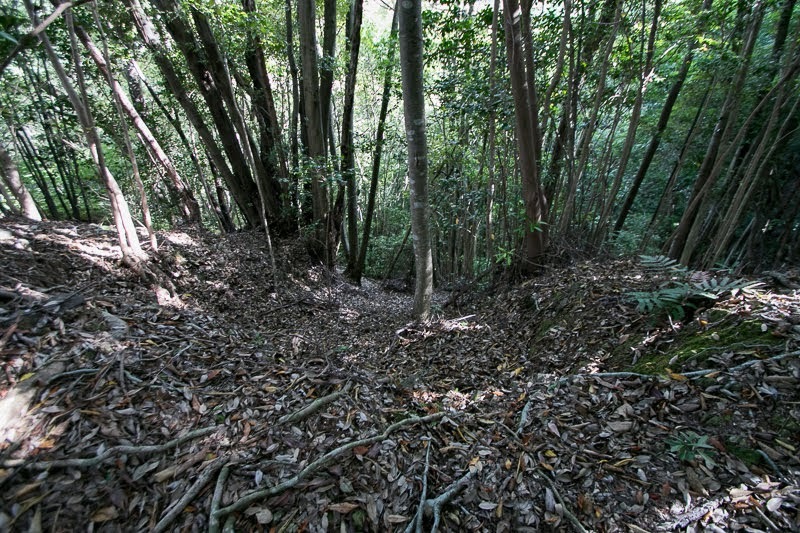 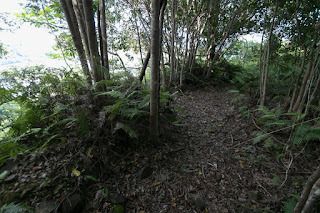 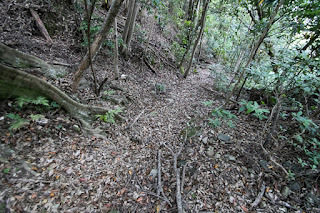 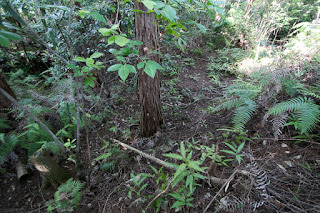 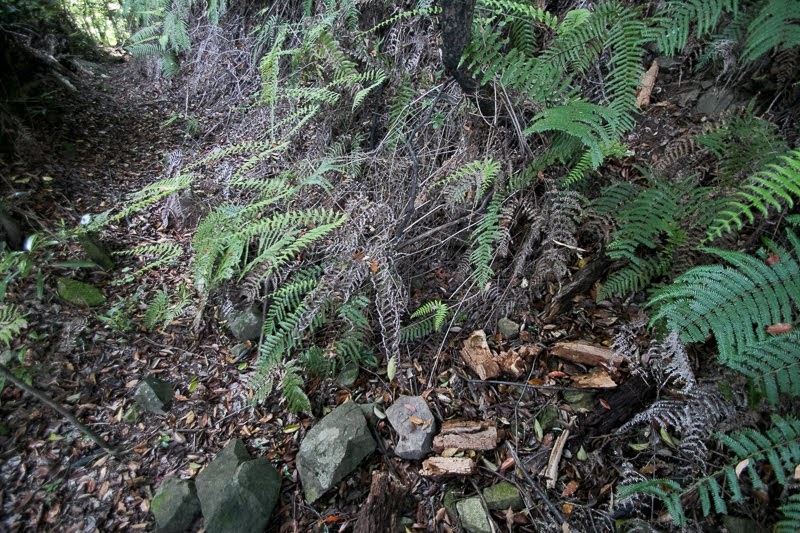 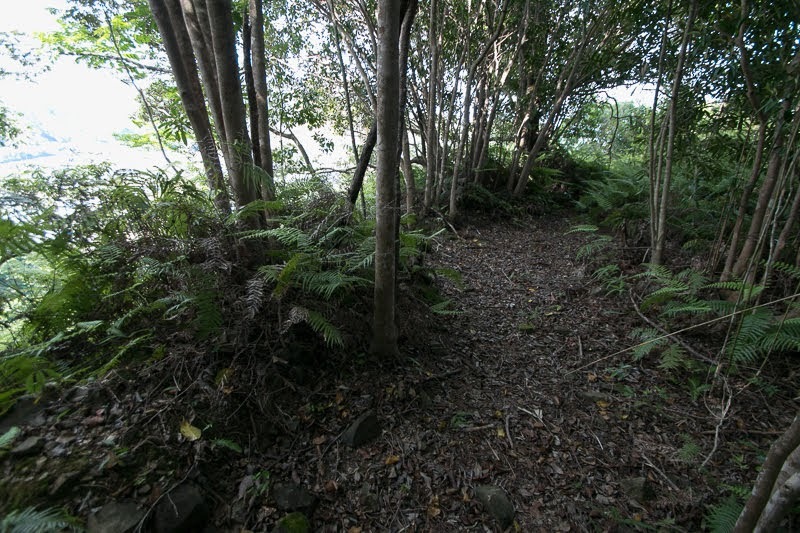 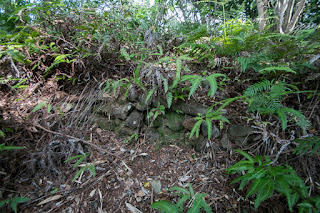 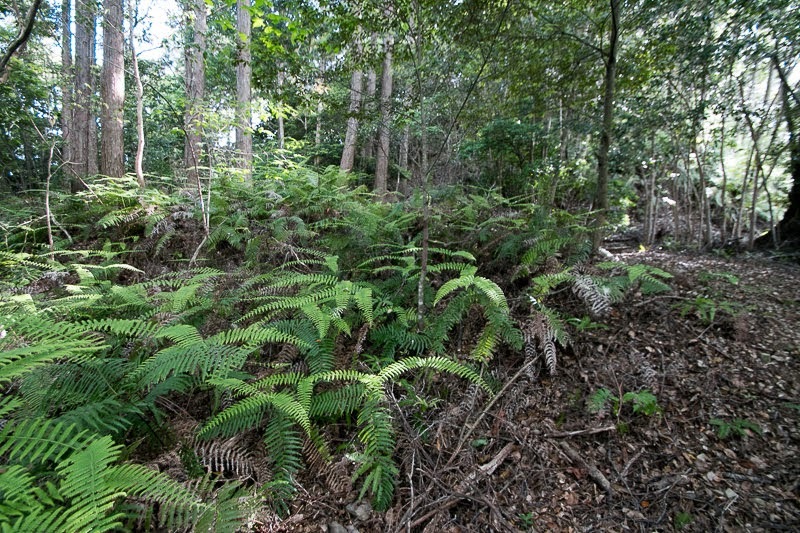 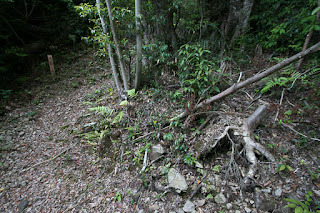 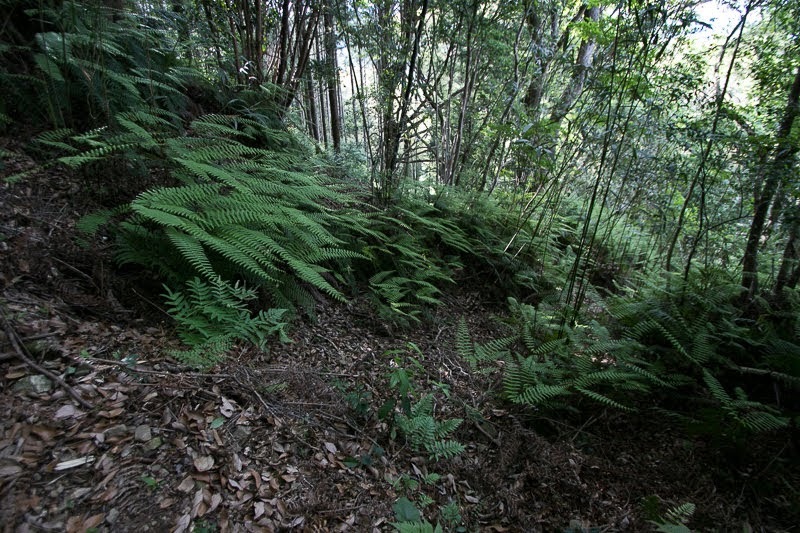 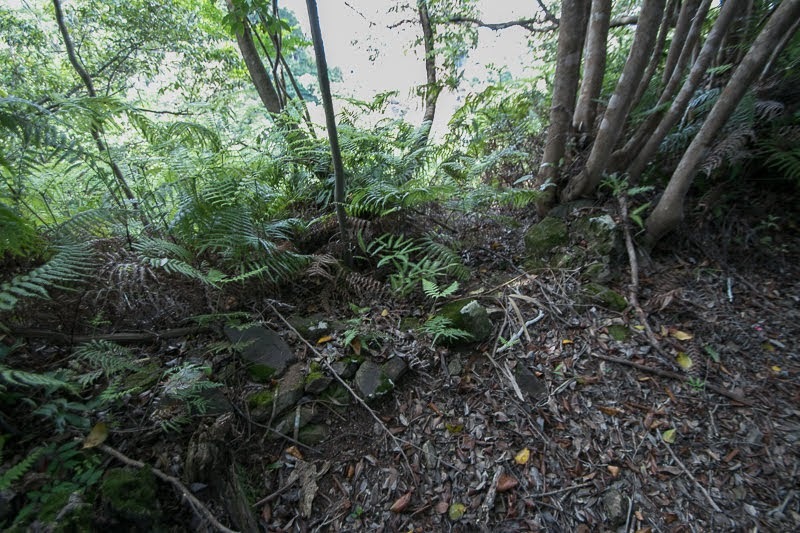 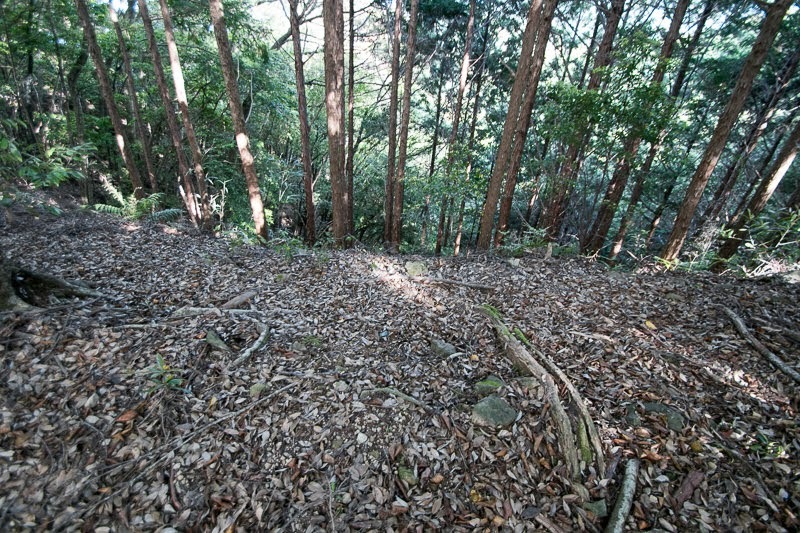 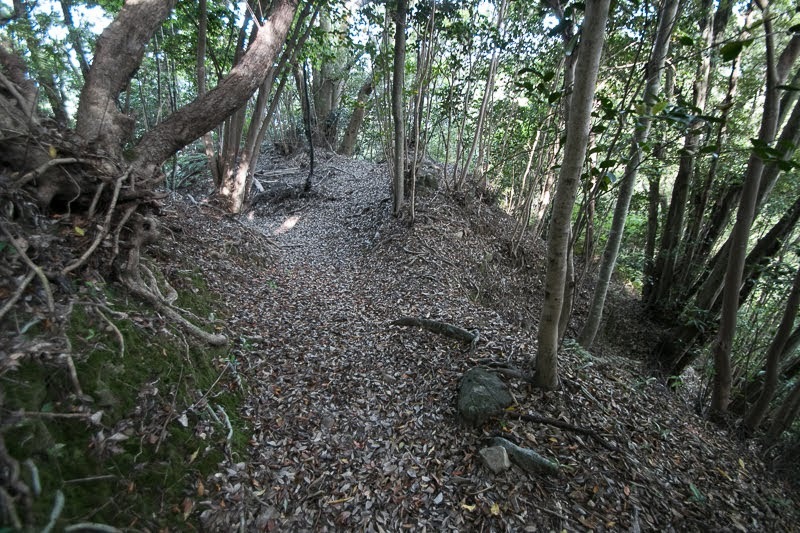 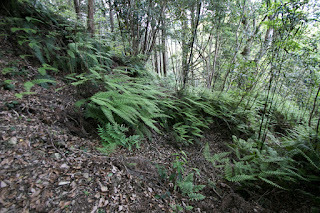 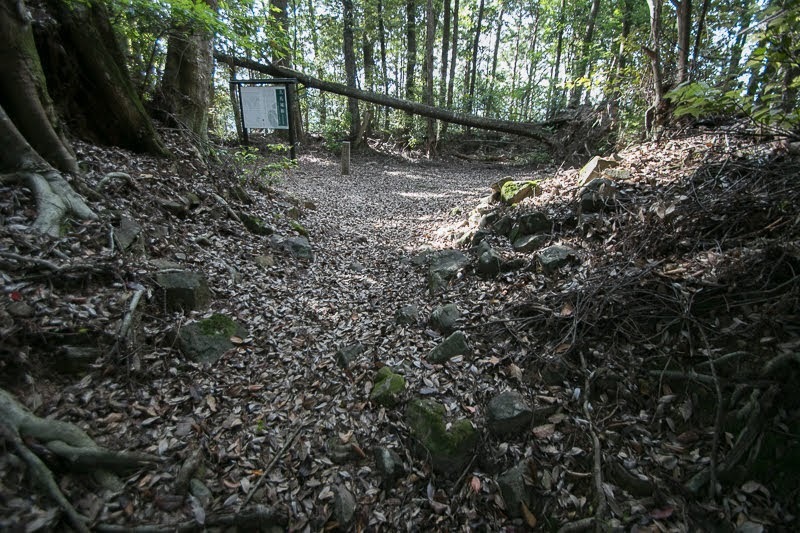 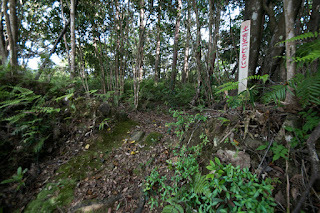 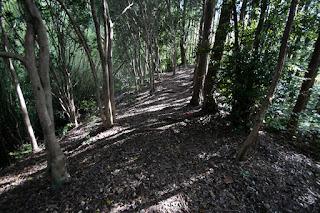 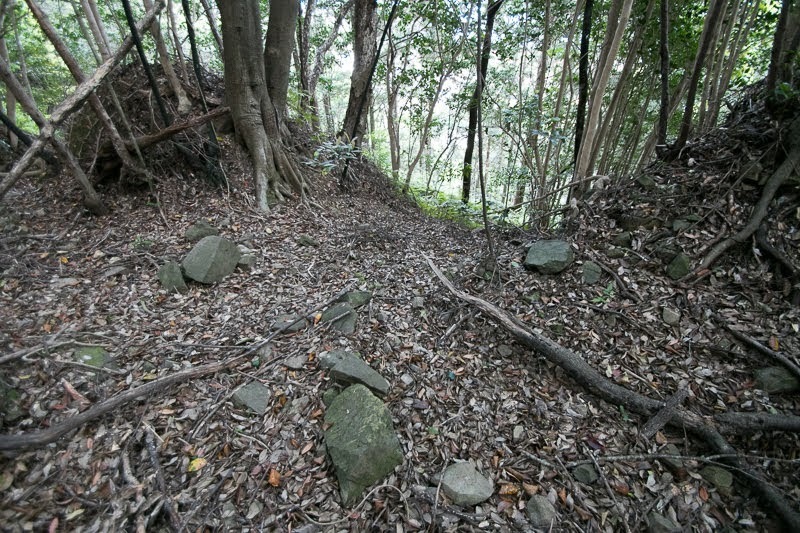 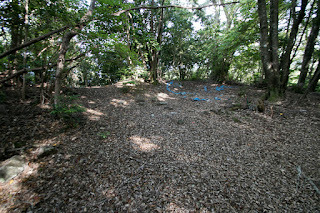 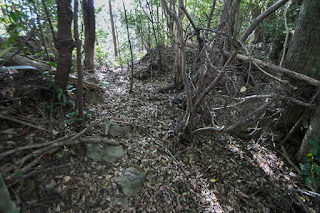 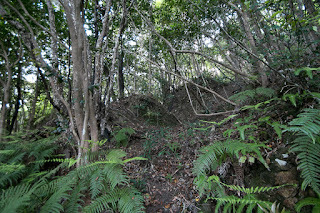 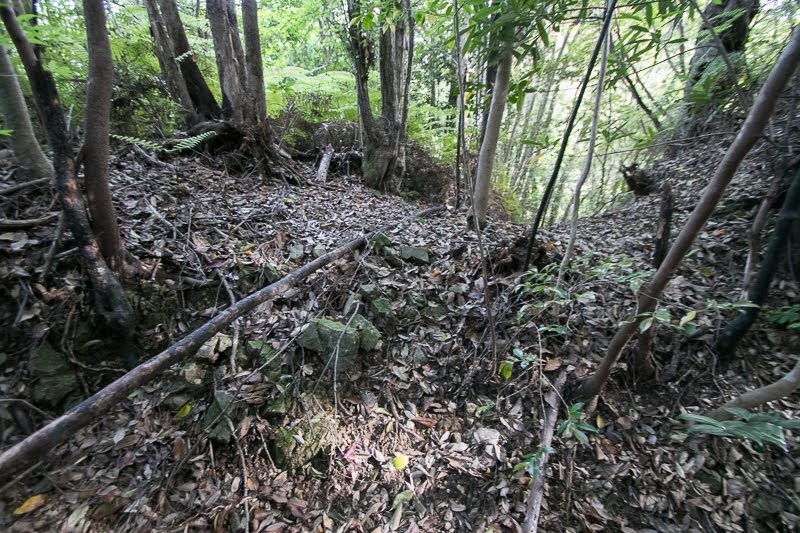 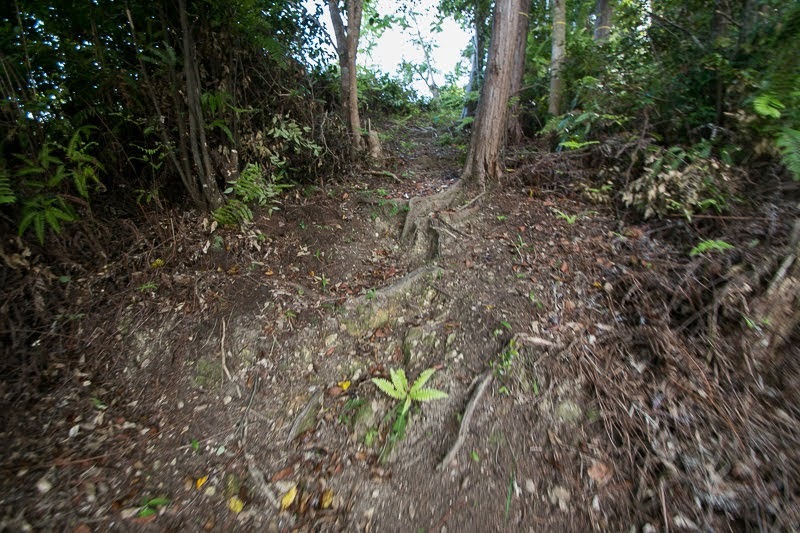 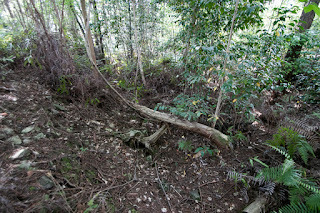 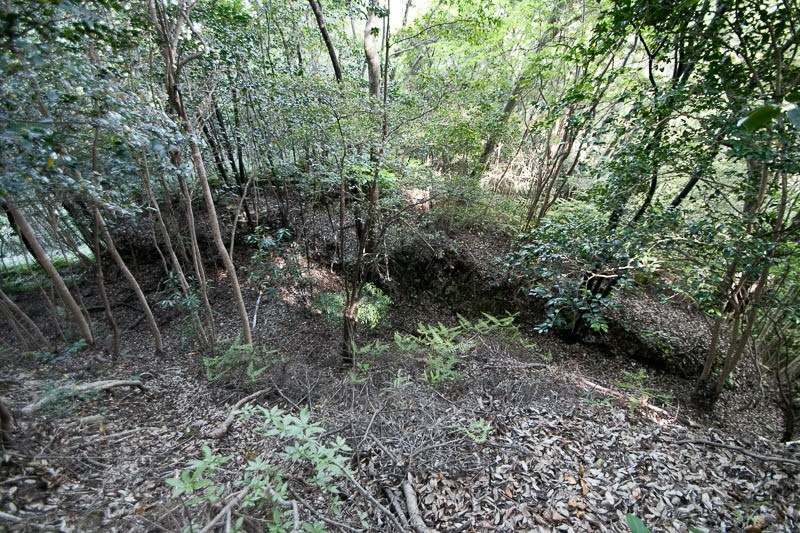 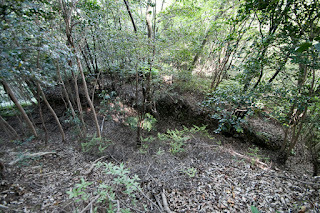 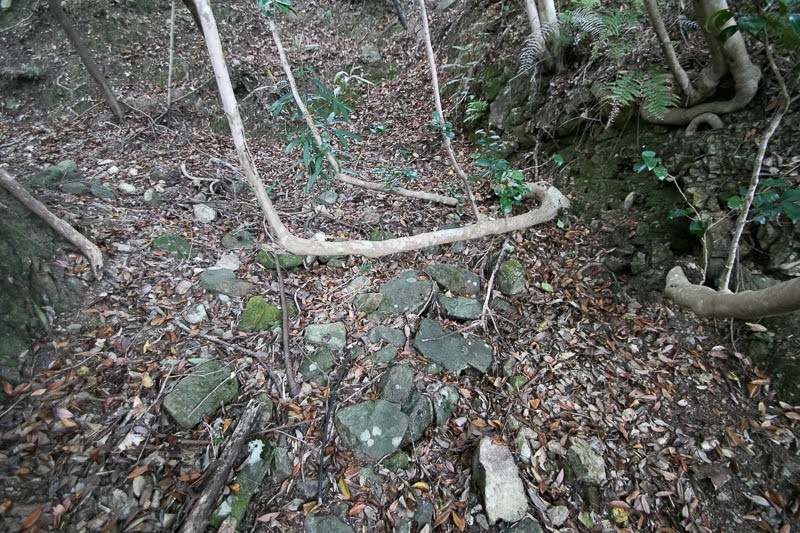 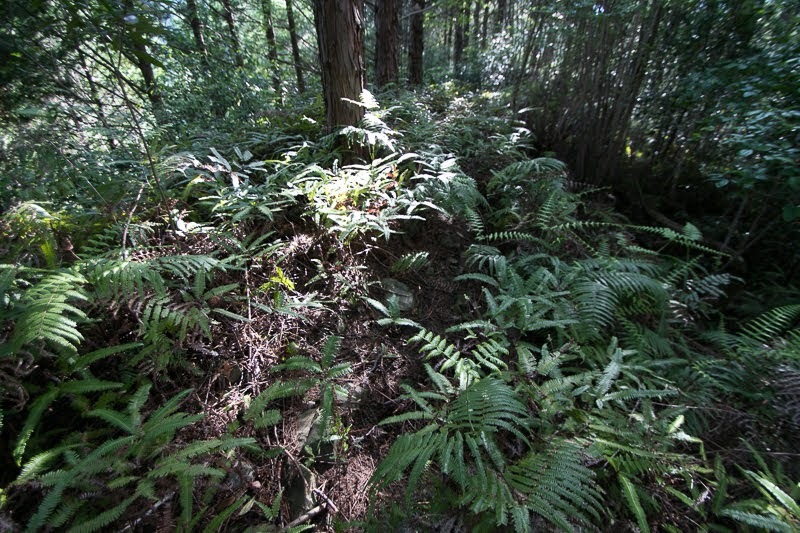 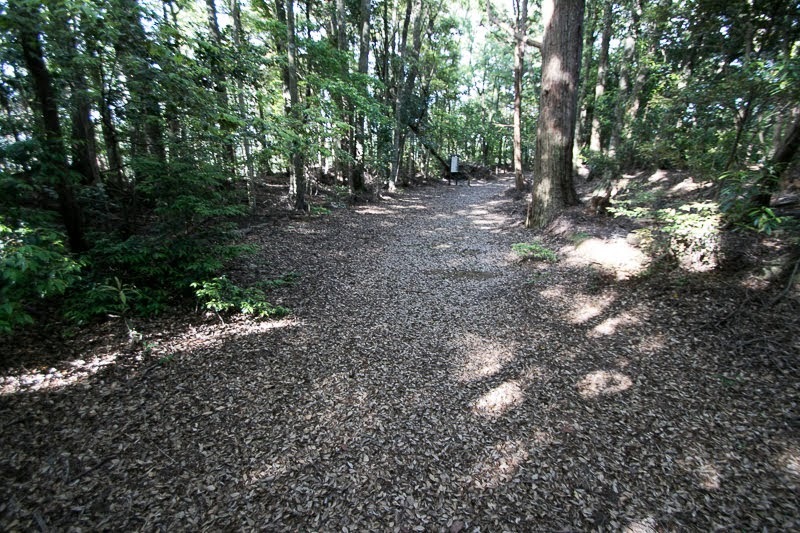 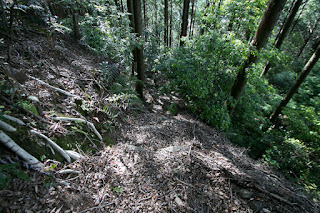 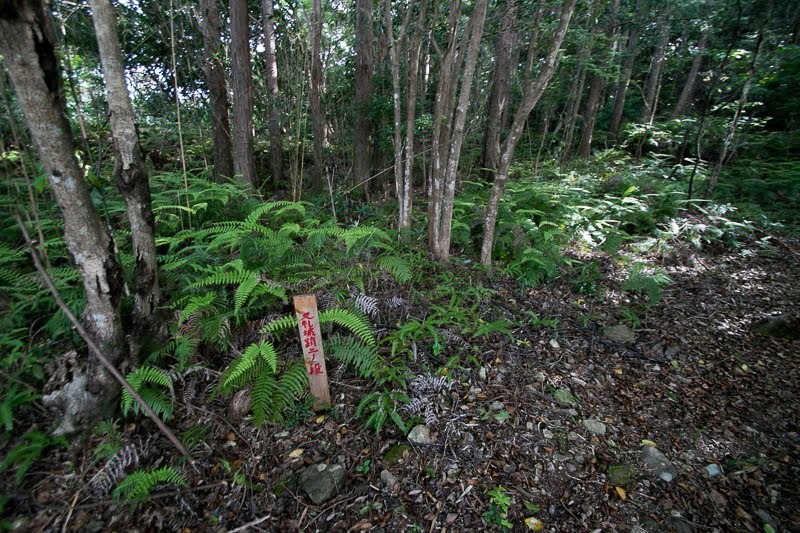 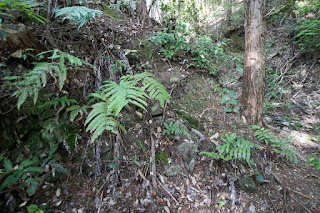 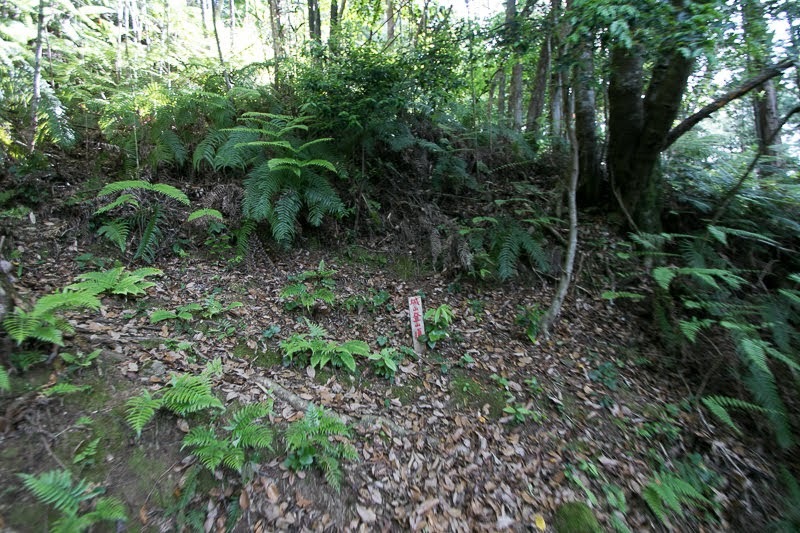 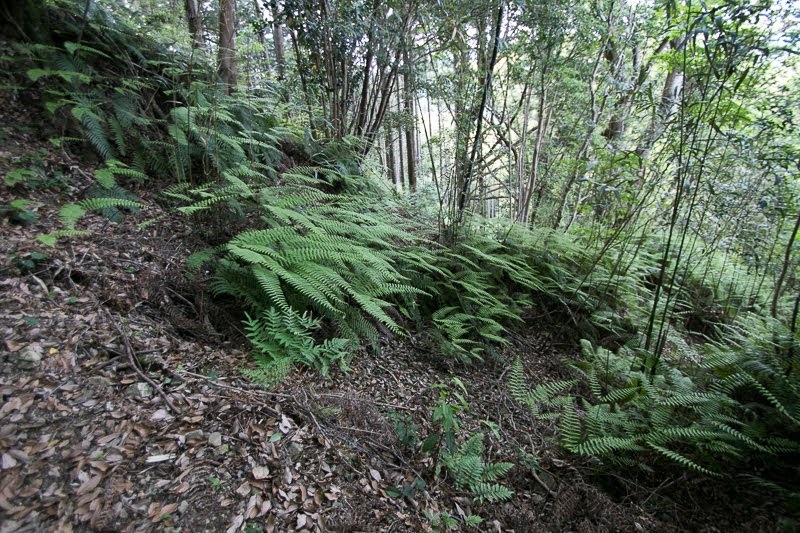 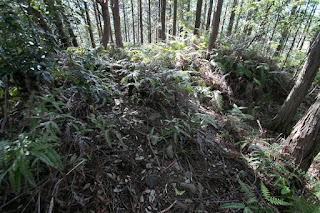 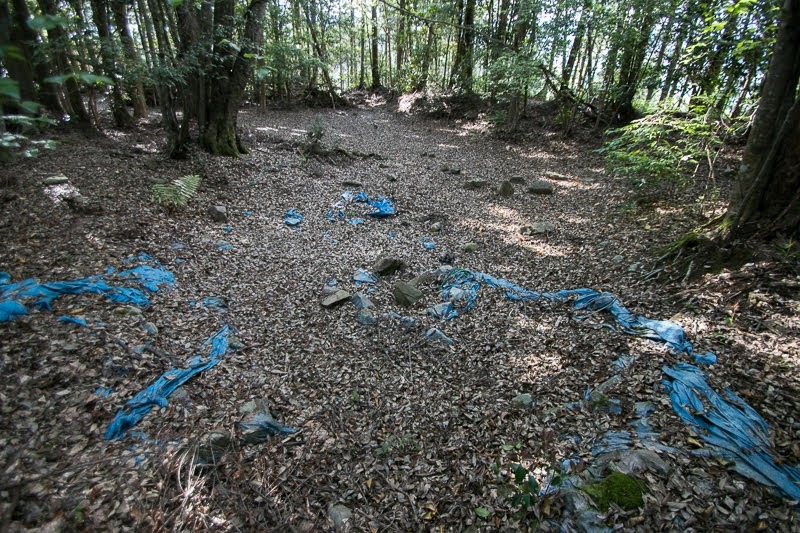 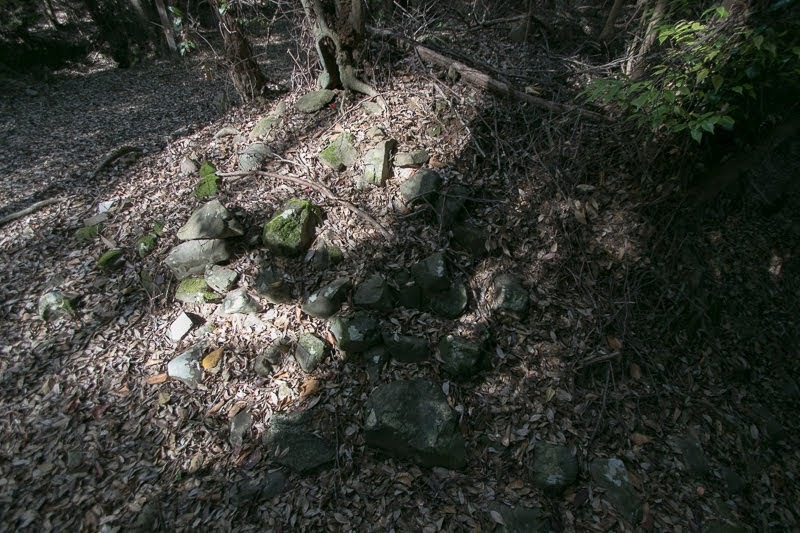 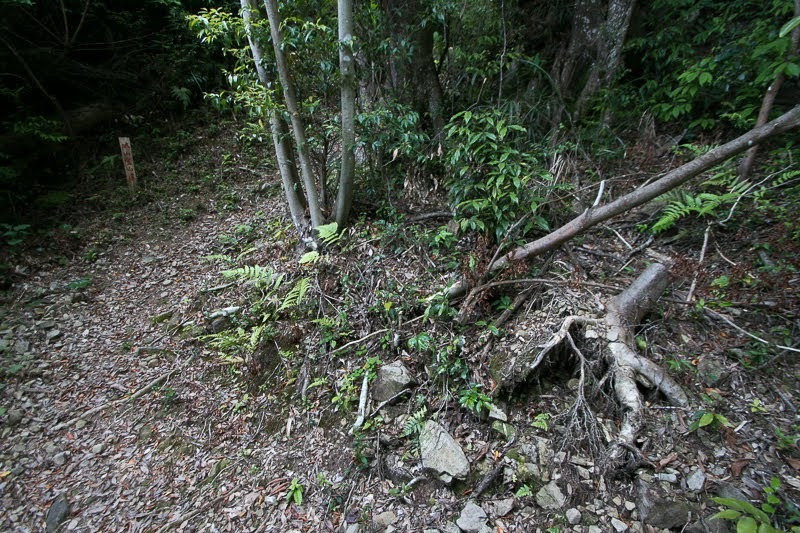 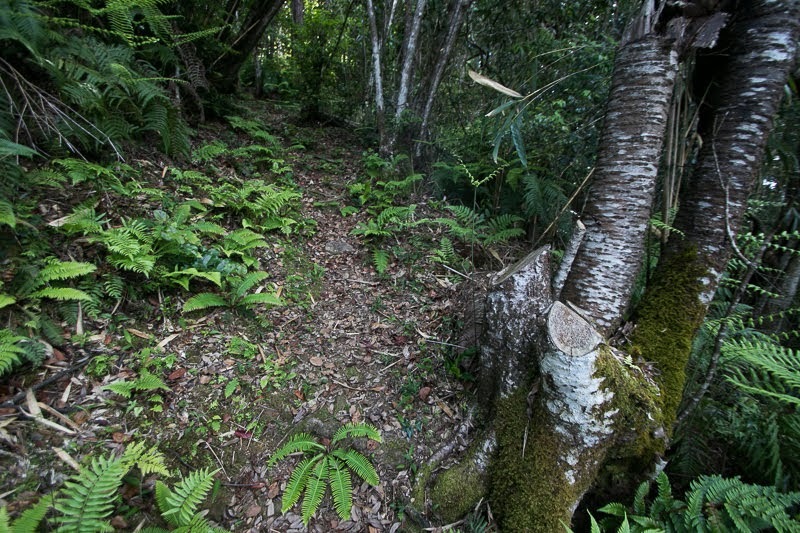 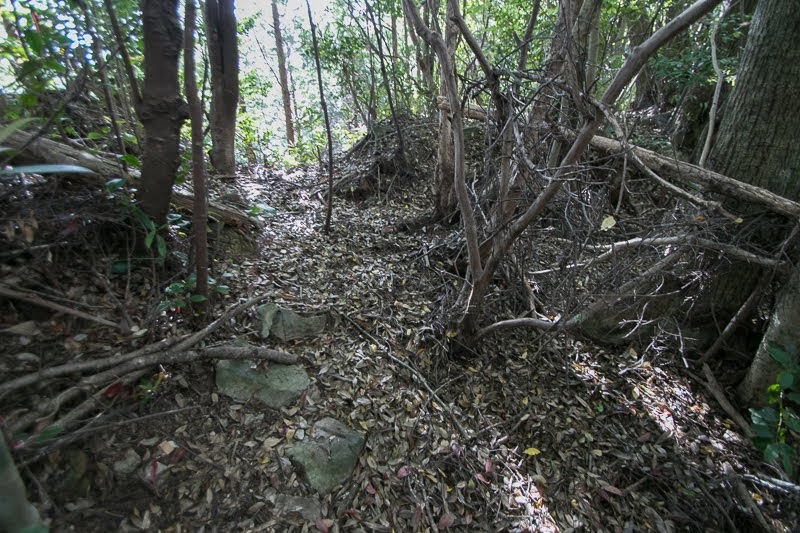 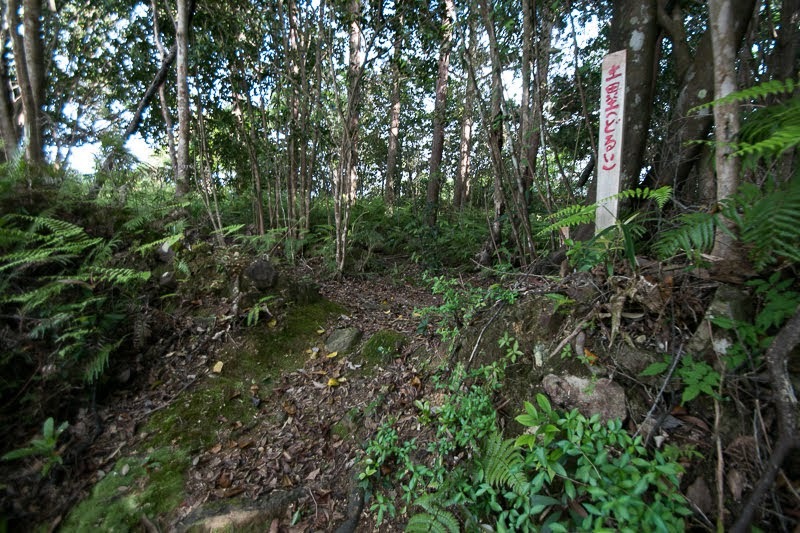 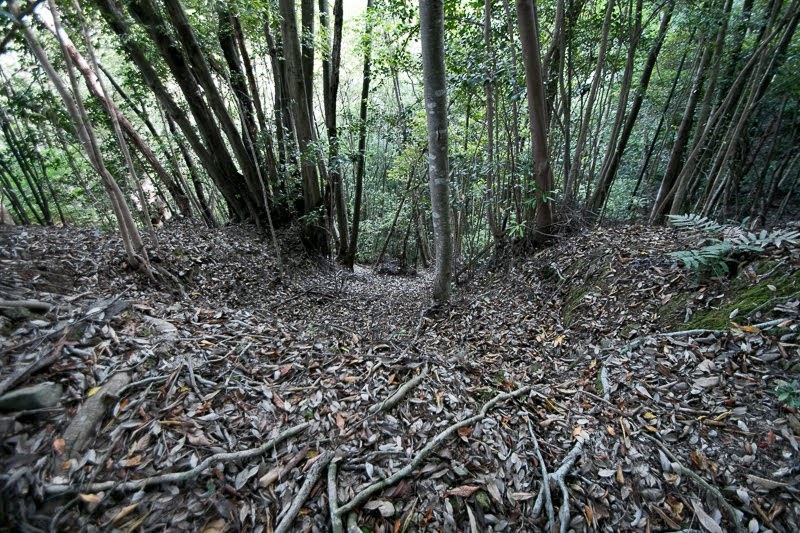 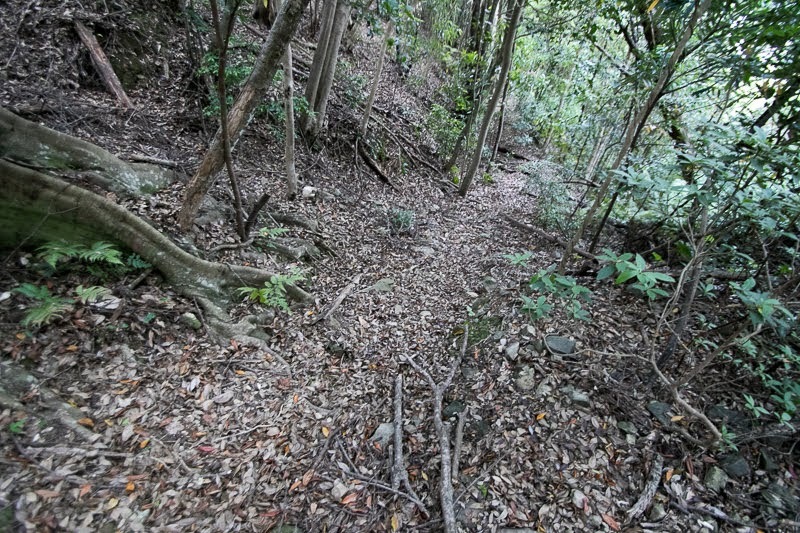 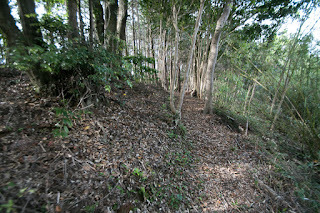 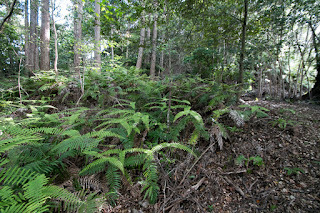 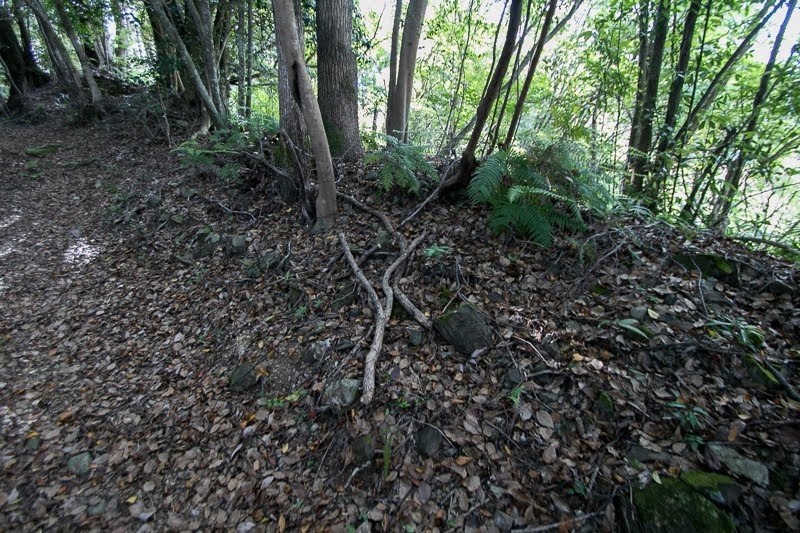 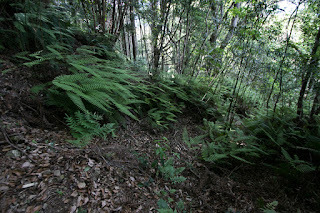 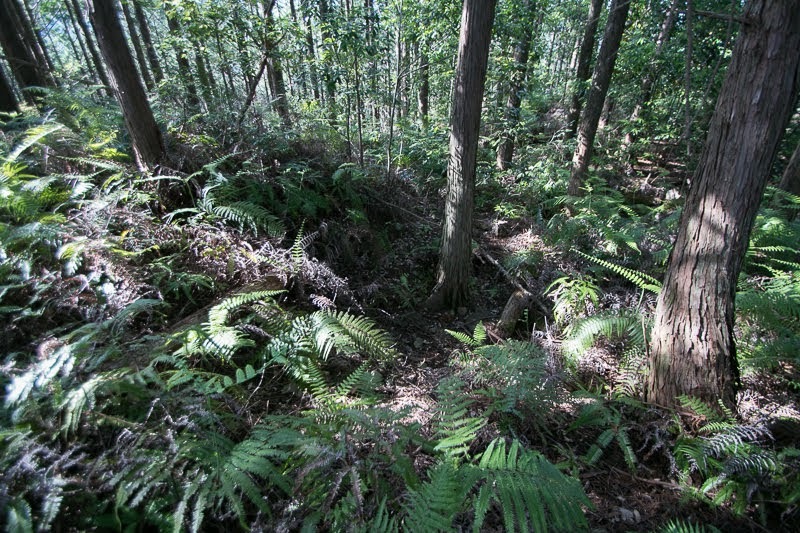 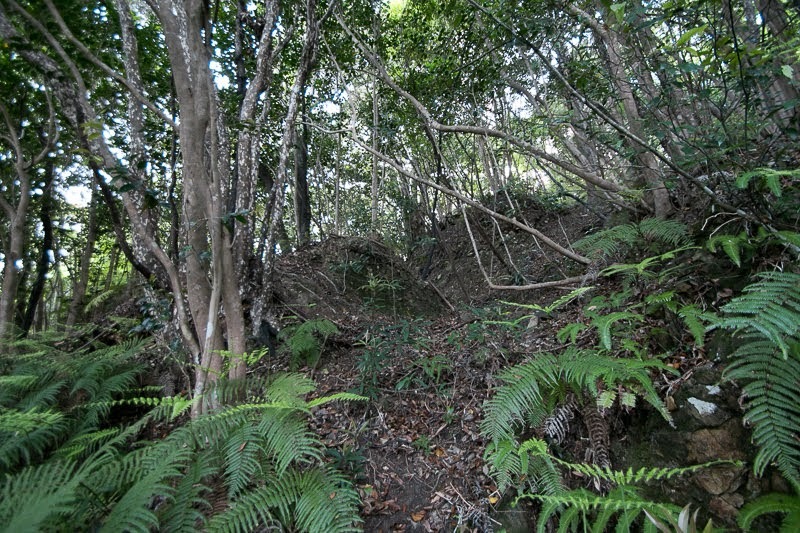 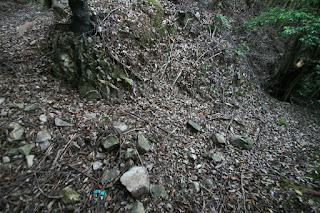 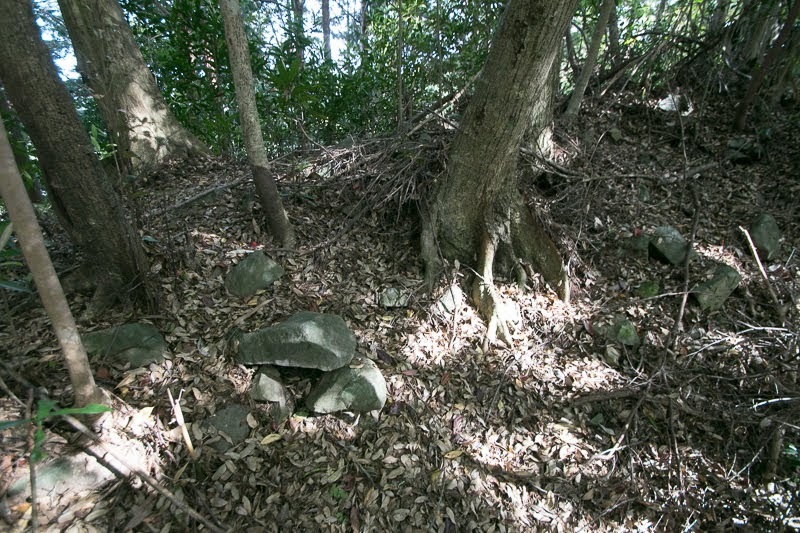 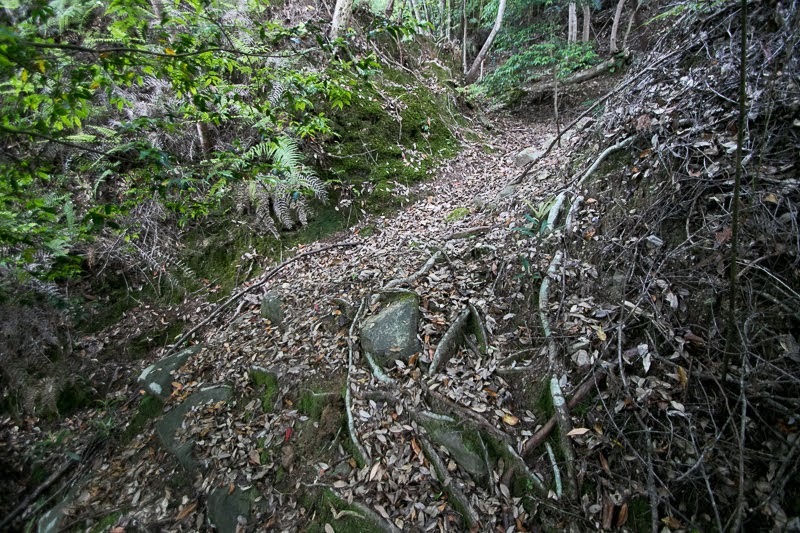 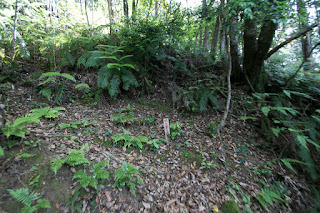 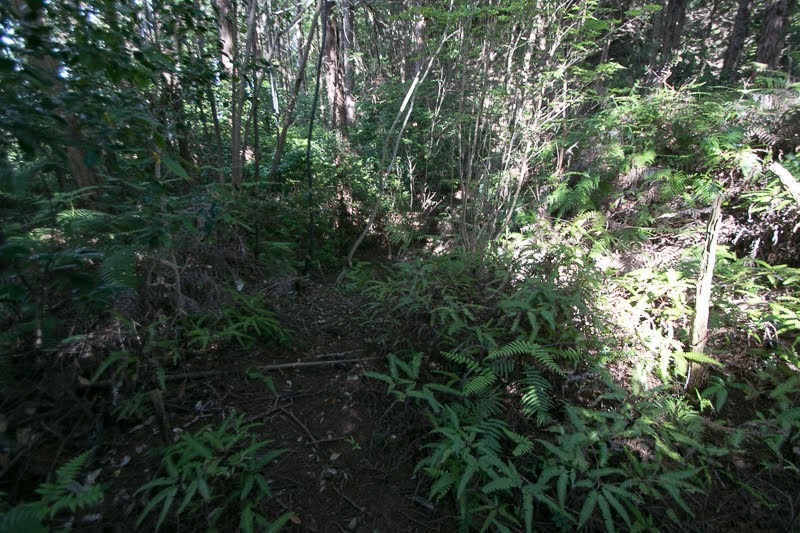 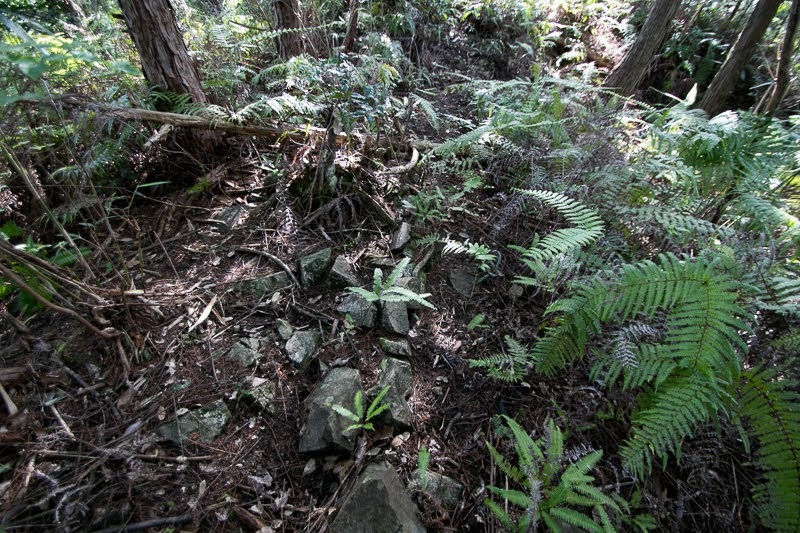 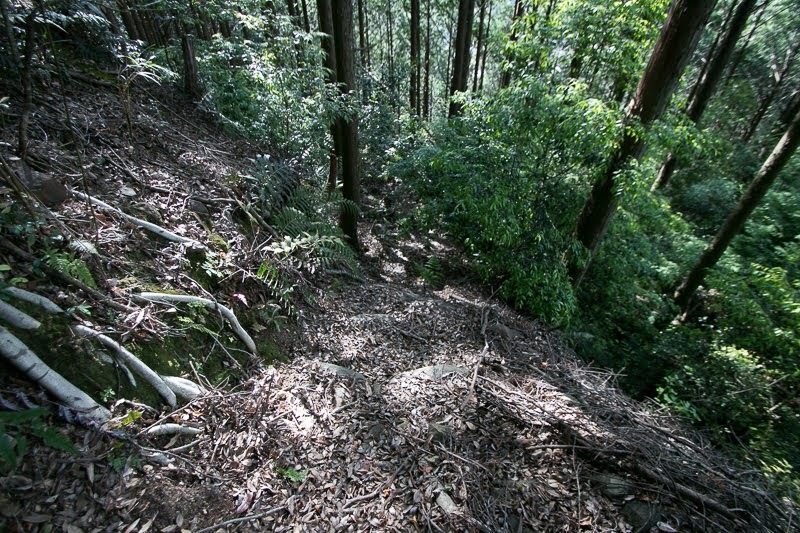 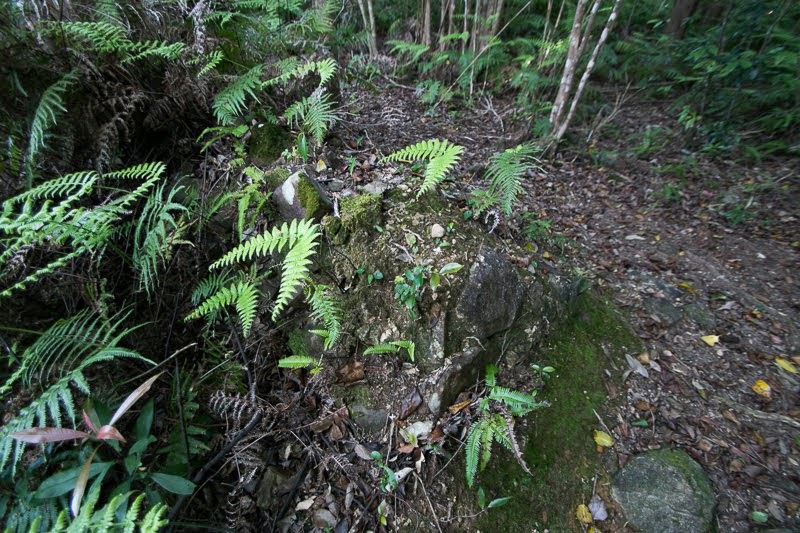 Slope of this area is securely protected by combination of vertical and horizontal dry moats radially surrounds the area. 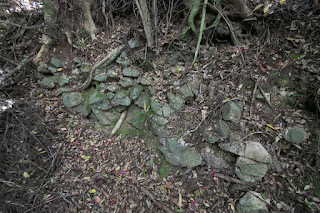 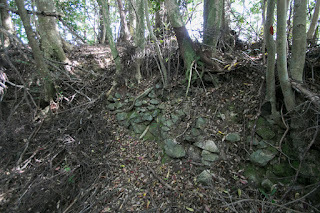 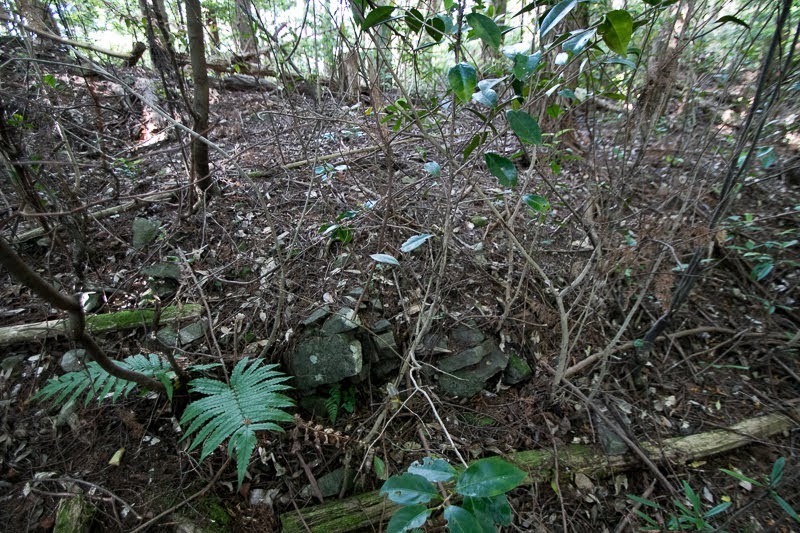 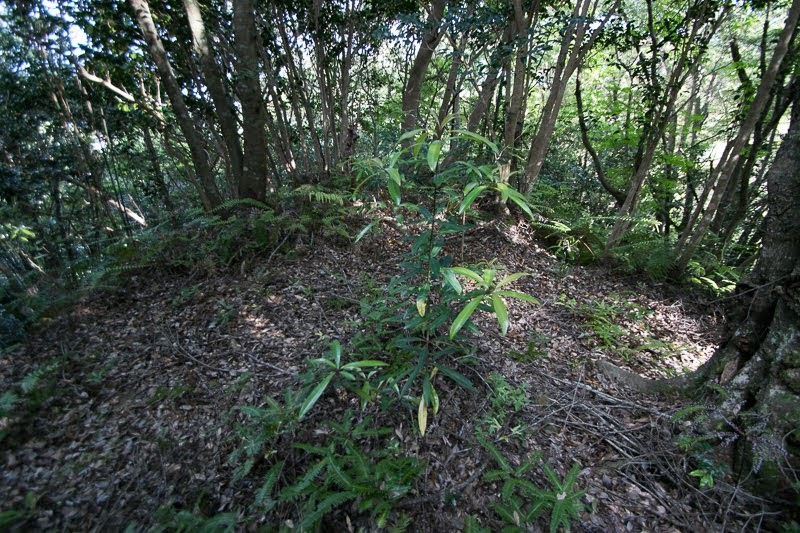 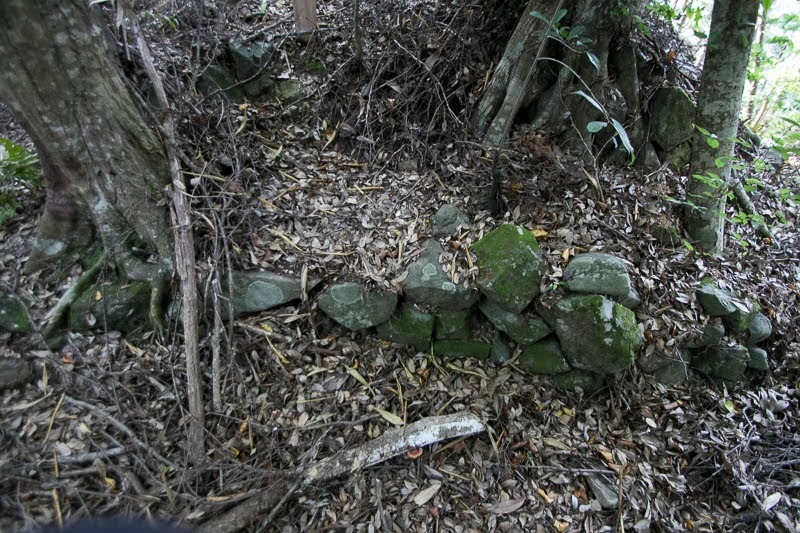 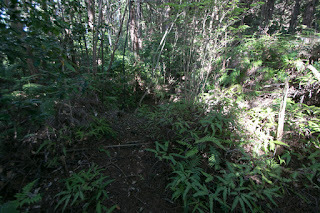 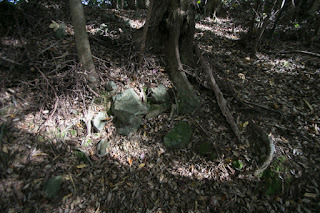 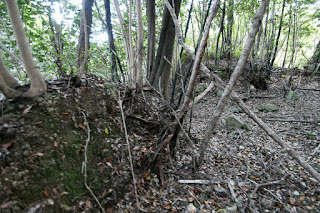 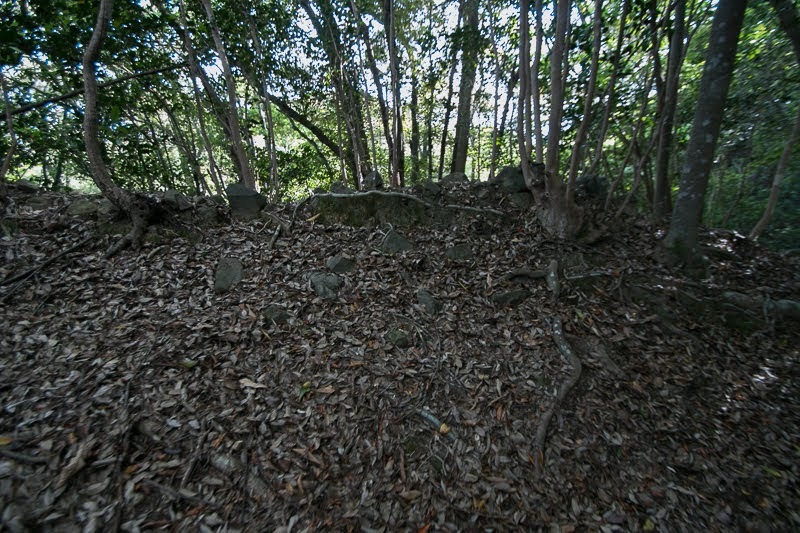 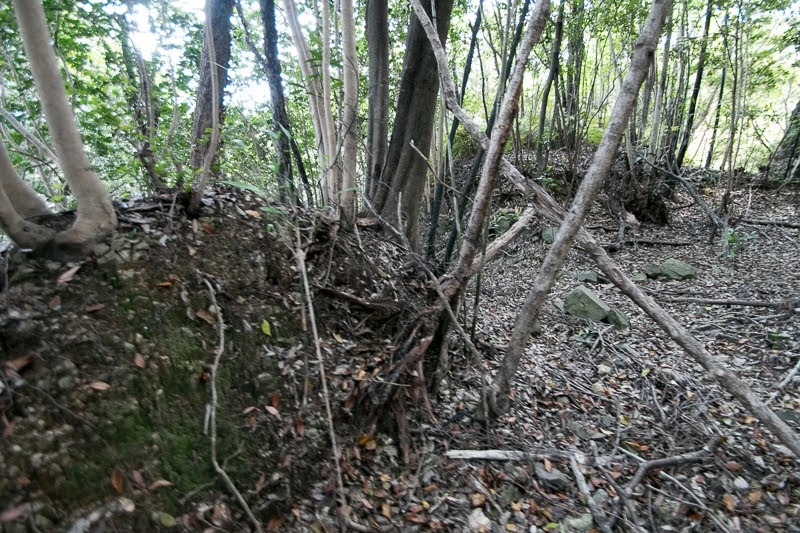 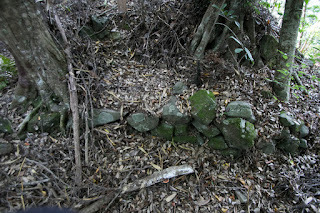 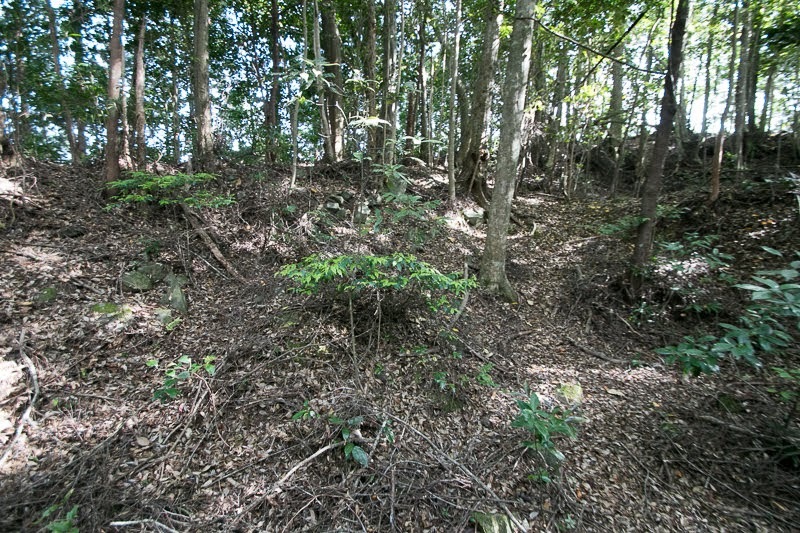 Third area at backside of central area is same size one also protected by clay walls and radially built dry moats. 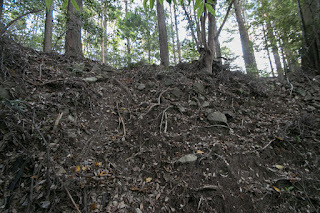 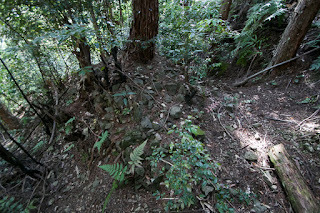 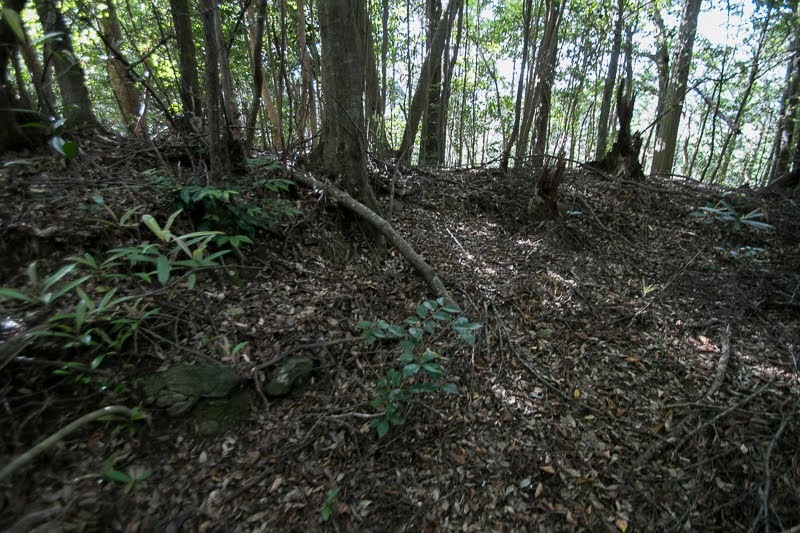 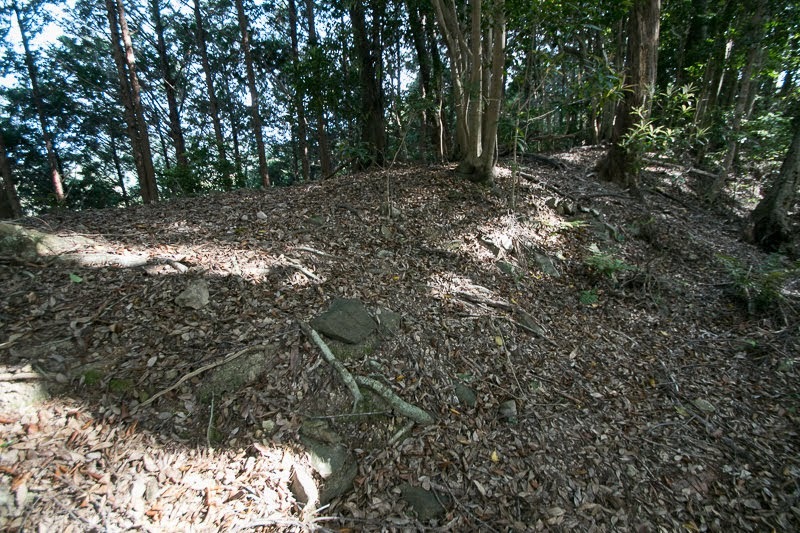 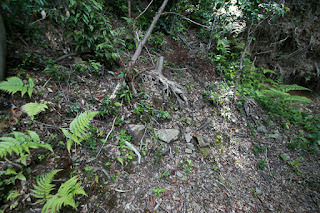 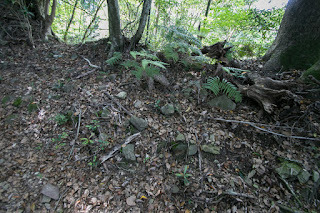 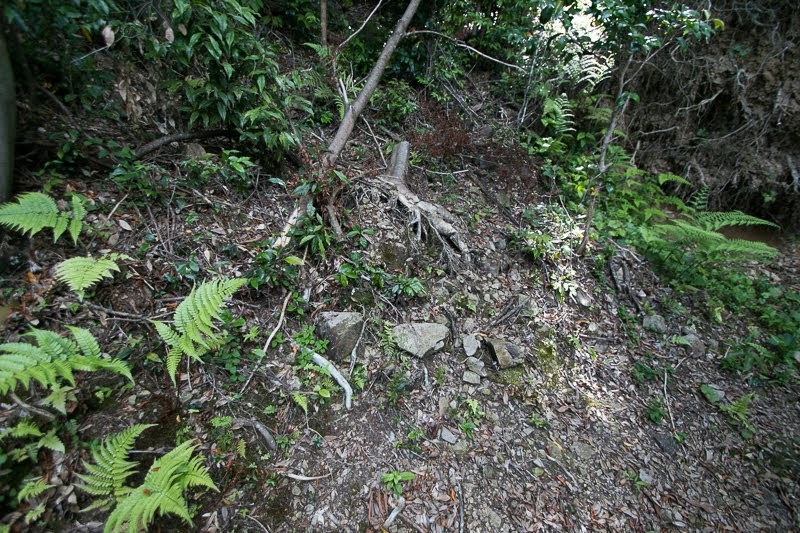 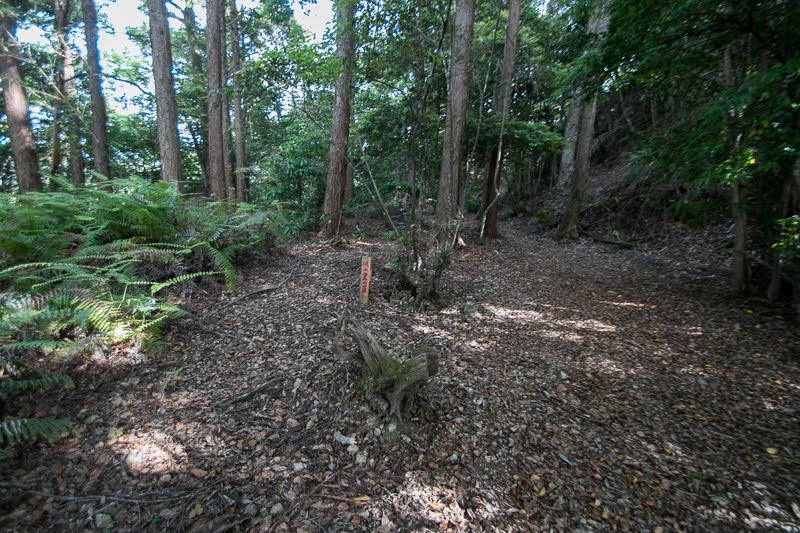 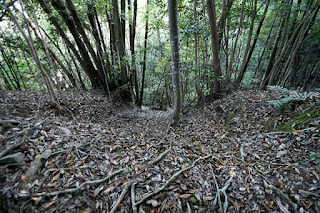 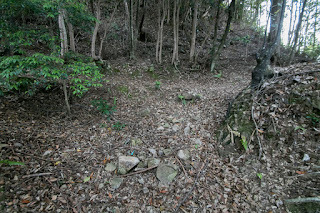 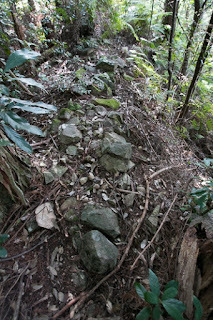 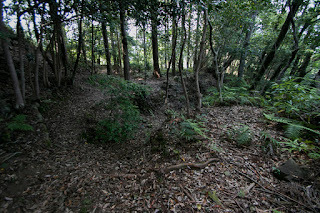 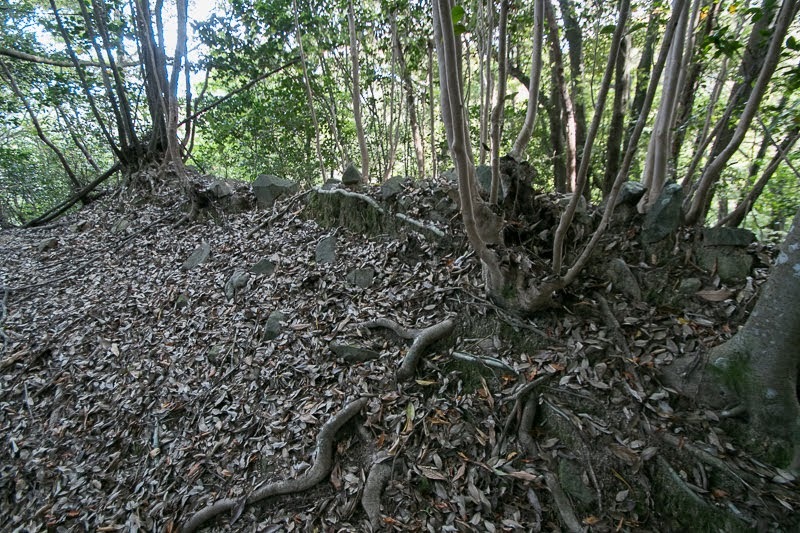 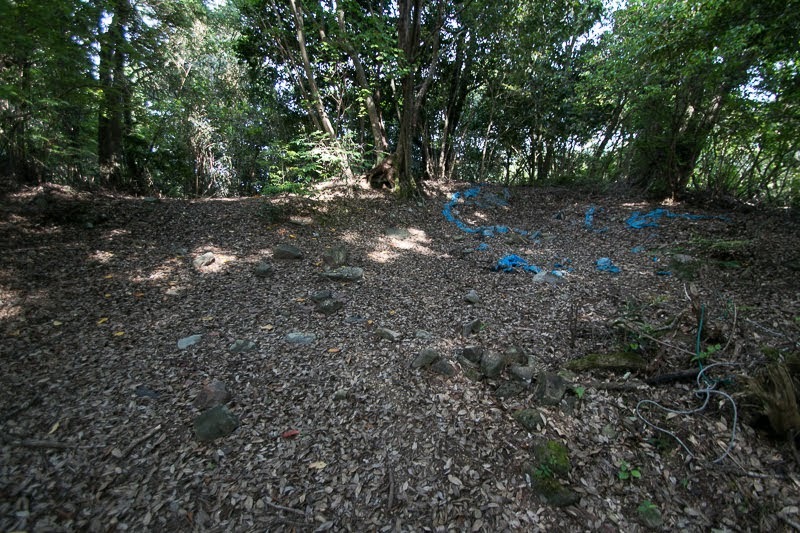 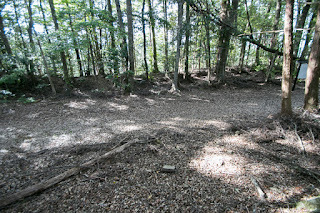 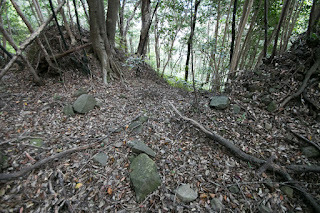 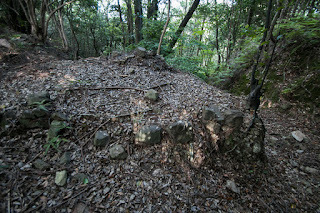 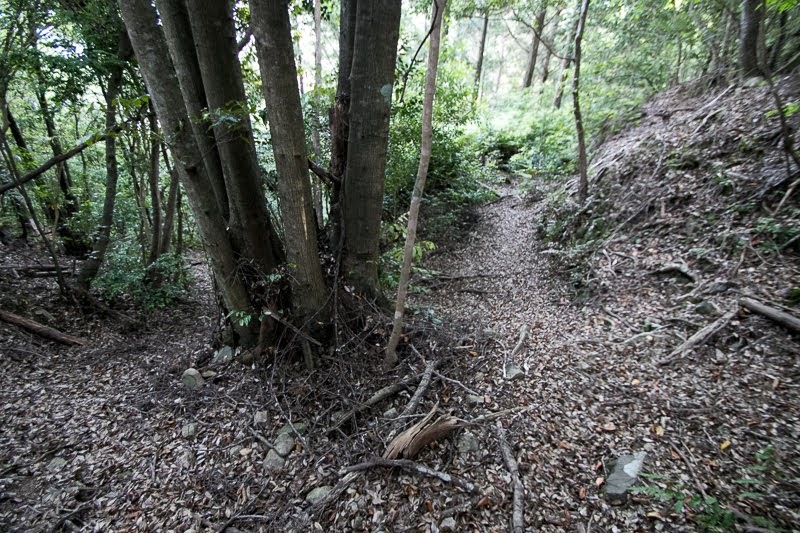 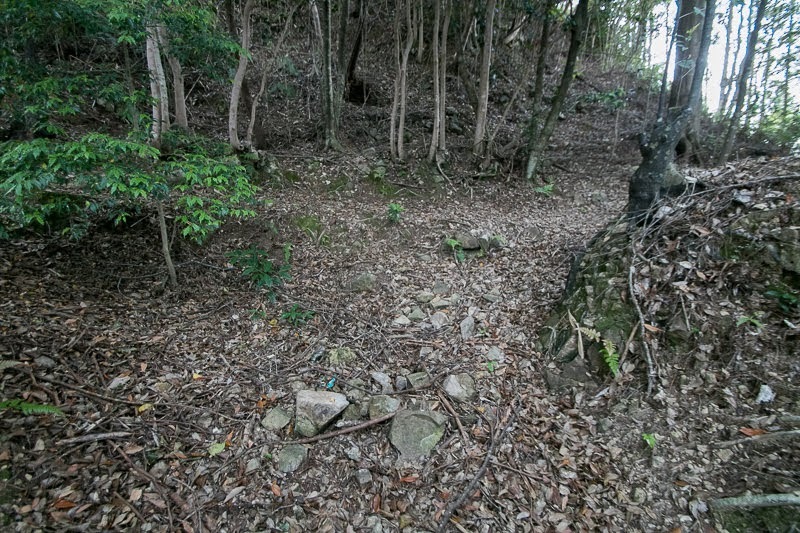 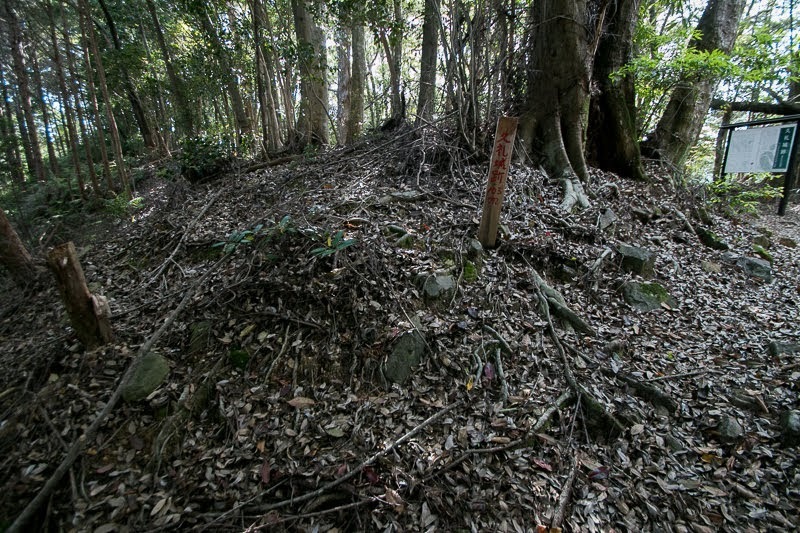 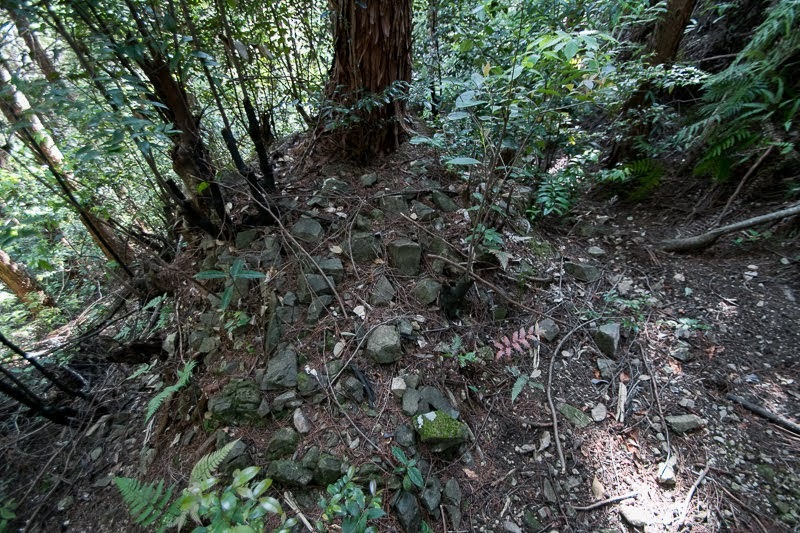 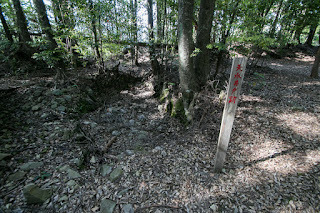 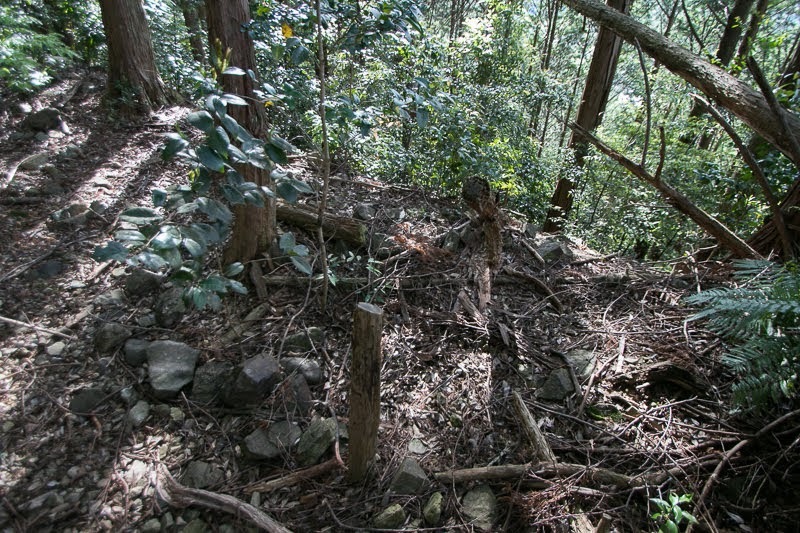 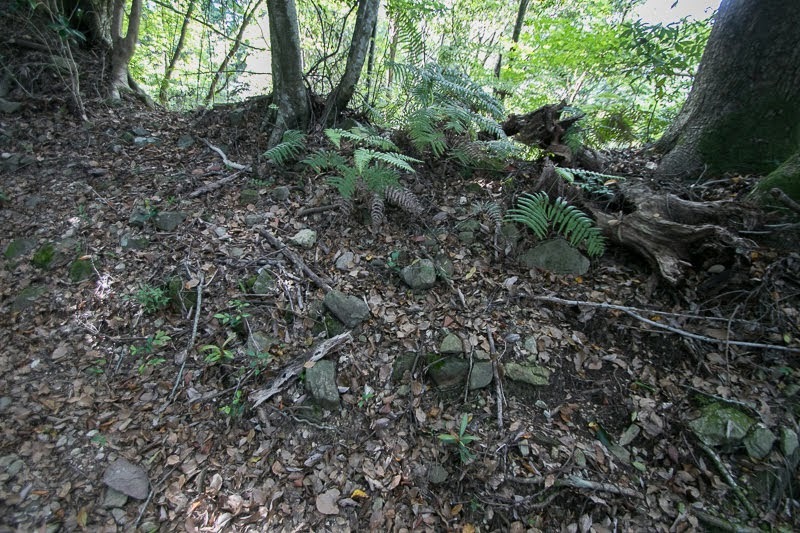 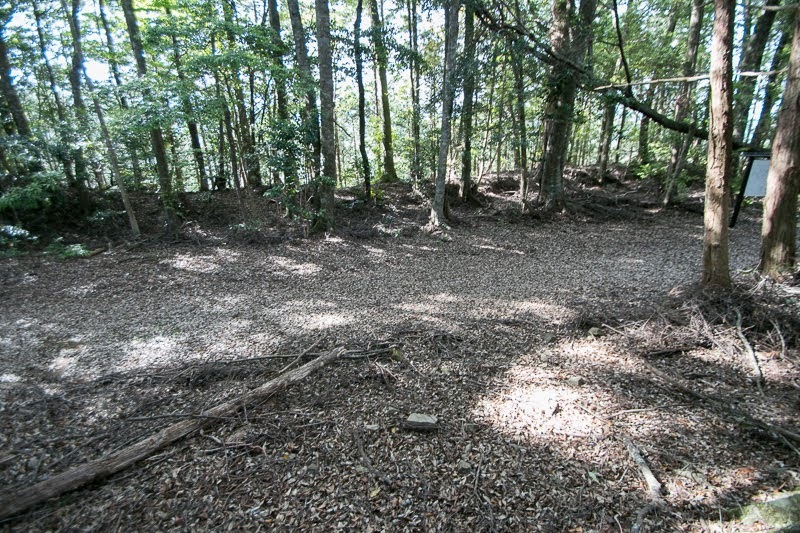 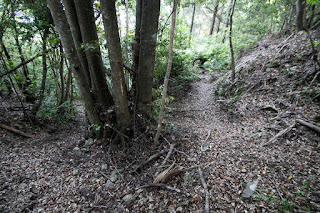 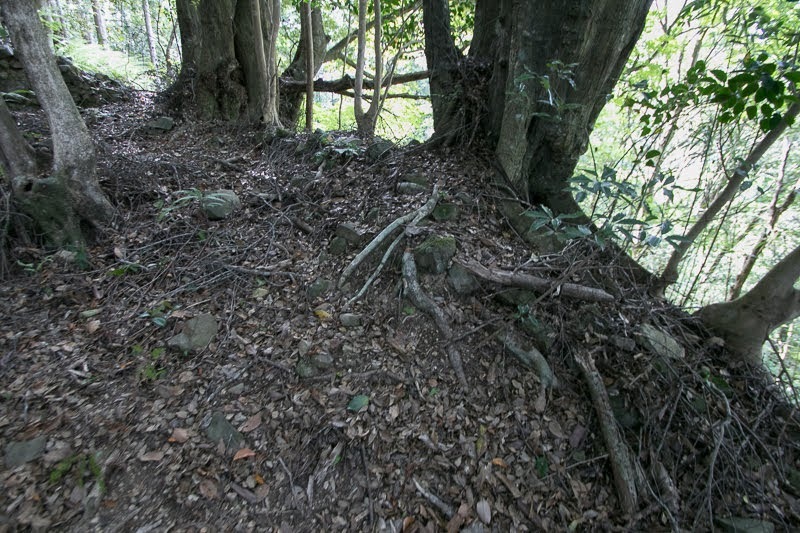 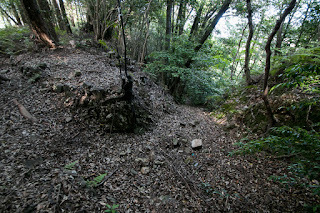 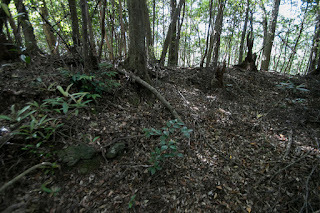 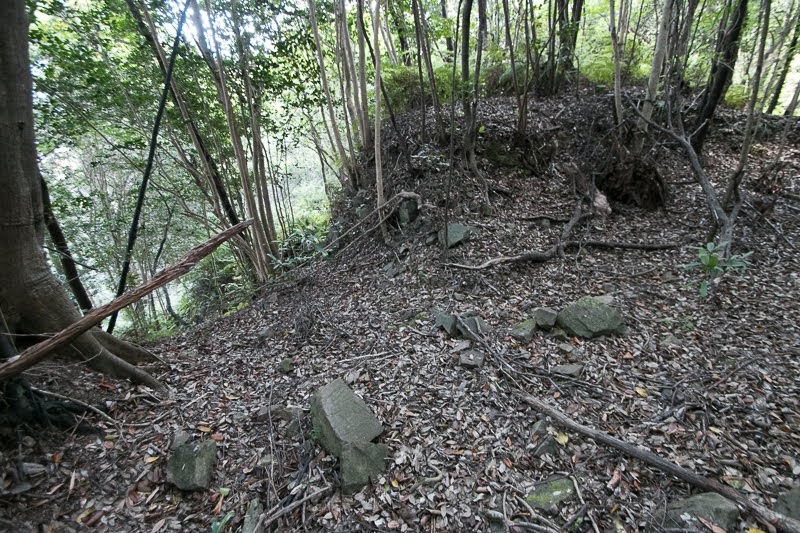 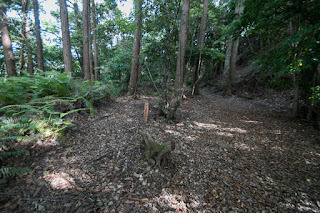 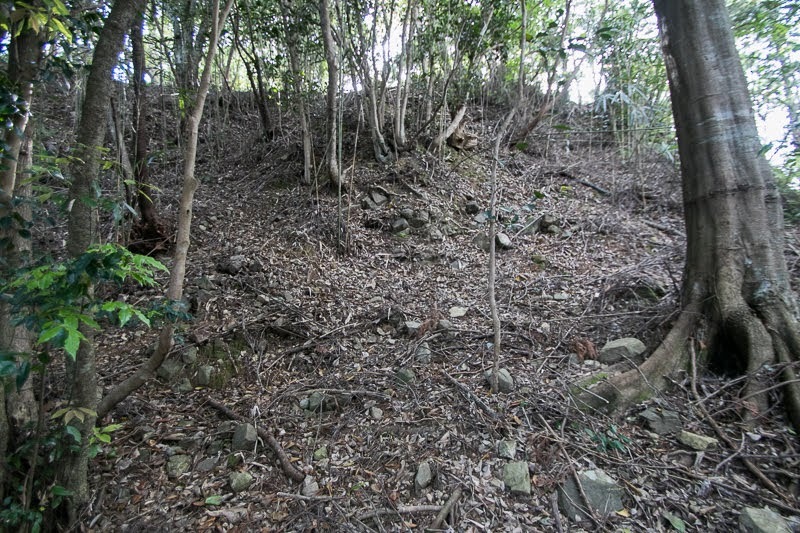 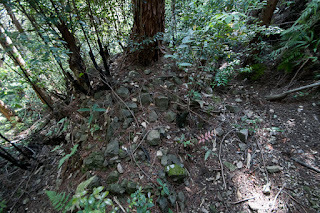 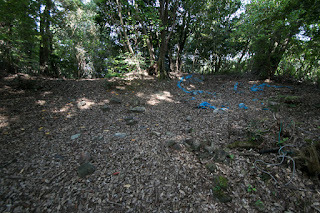 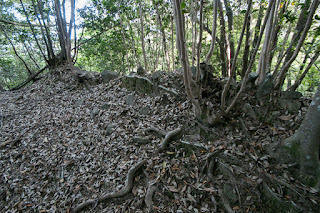 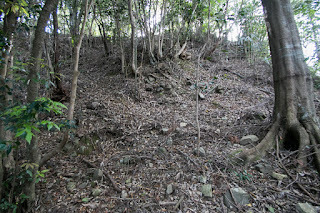 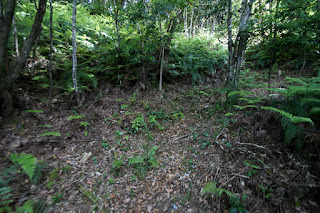 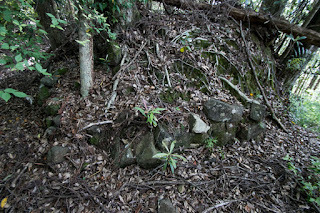 The saddle point at the south of central area toward next ridge is the weak point of the castle thus thoroughly divided by the combination of five dry moats and to prevent detour of enemy numerous vertical moats are built at next slope. 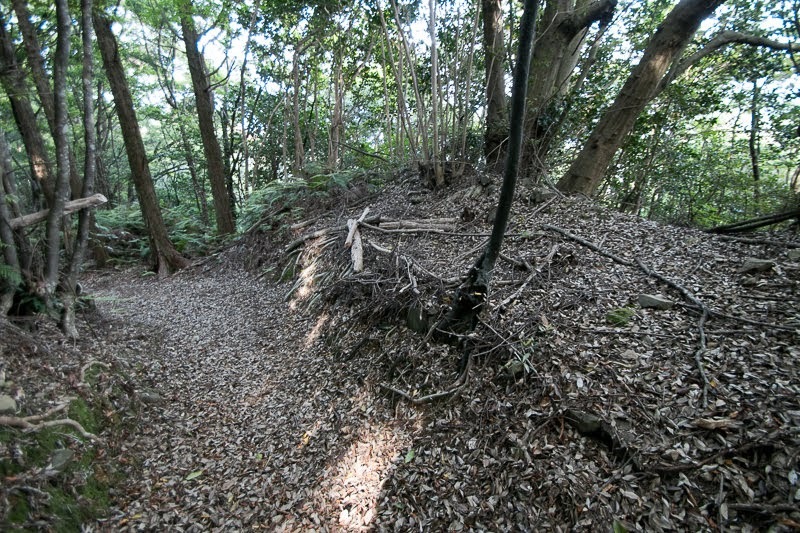 Use of numerous vertical and horizontal dry moats is similar to Oko castle or Motoyama castle which were major castle of Chosokabe clan at that period. 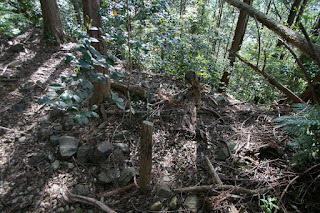 Thus it shows the importance of Kure castle. 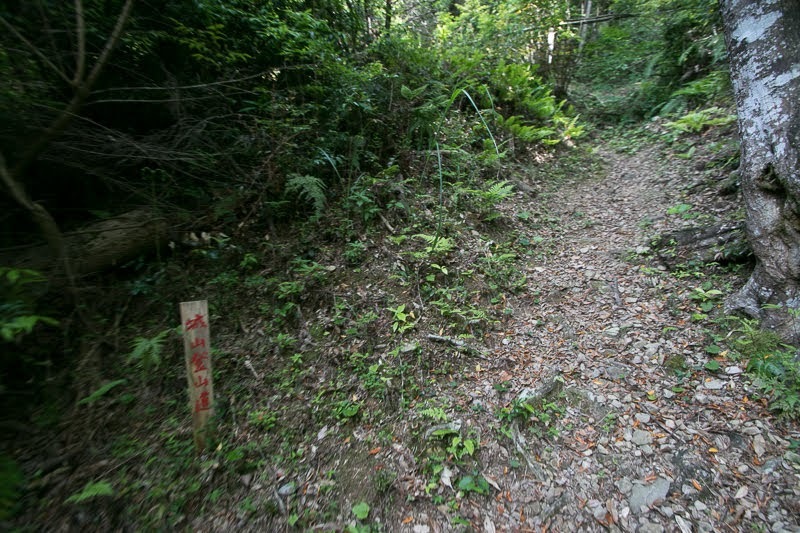 In 1574, Kanesada Ichijo was forced to retire by important retainers and expelled to Bungo province. 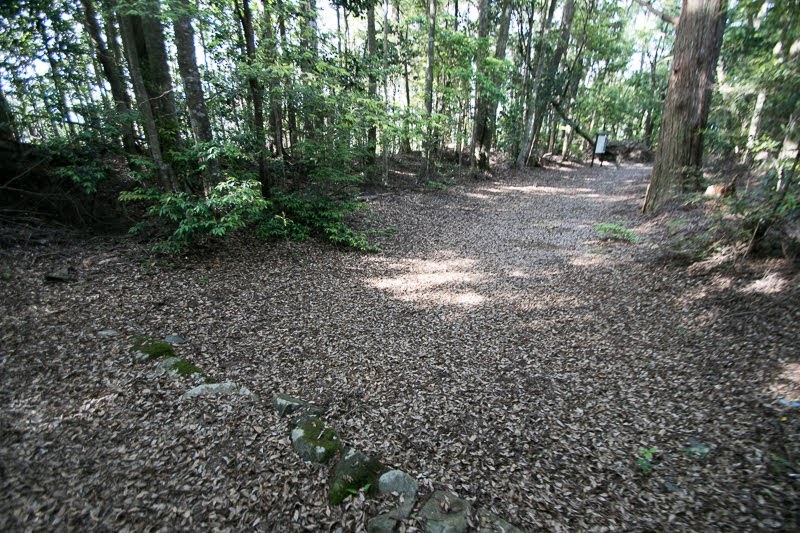 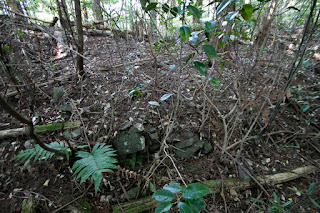 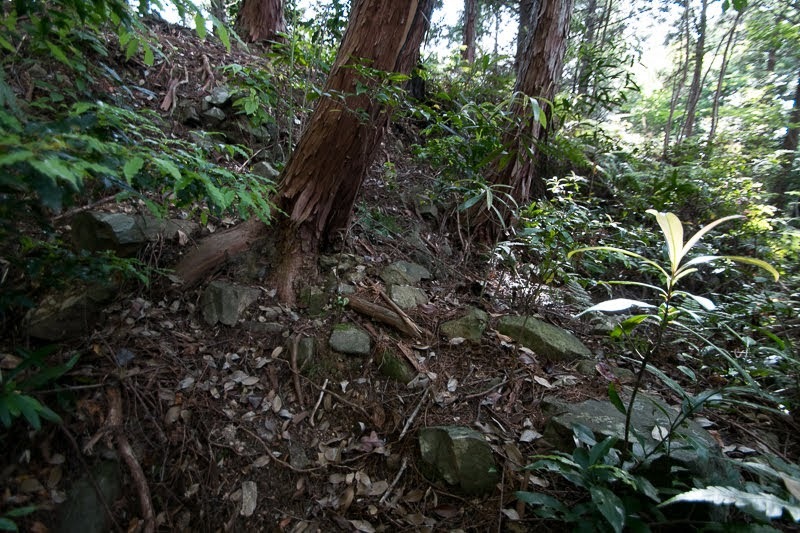 Utilizing this internal conflict Motochika occupied Nakamura castle, then next year broke Kenesada who returned to restore his authority at the battle of Shimanto river. 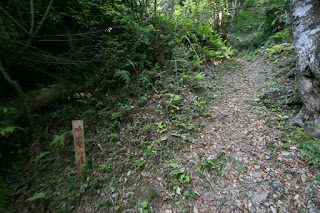 Ichijo clan totally disappeared as the warlord, and Motochika could unite Tosa province 15 year after his succession. 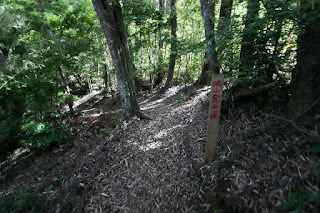 After the unite of Tosa province, Motochika aggressively marched to other provinces of Shikoku island without rest. 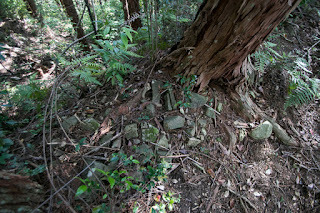 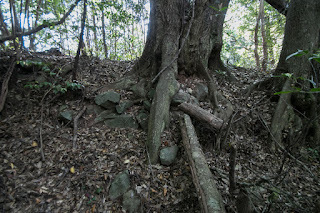 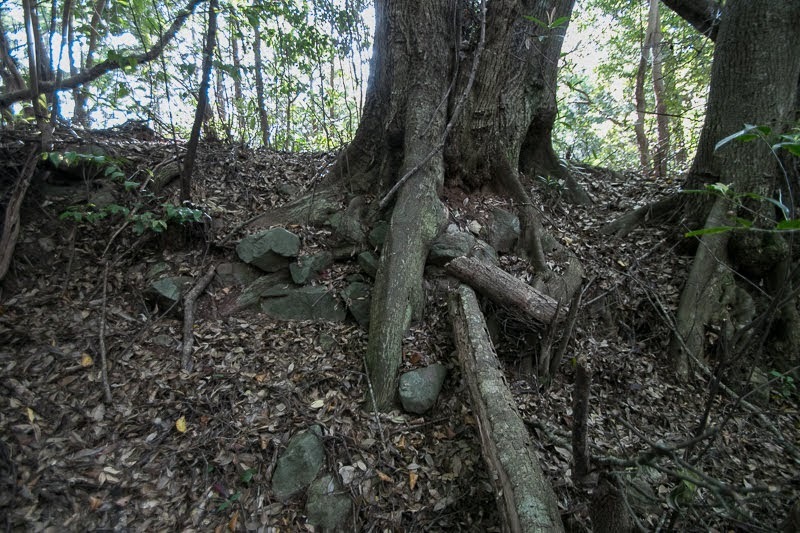 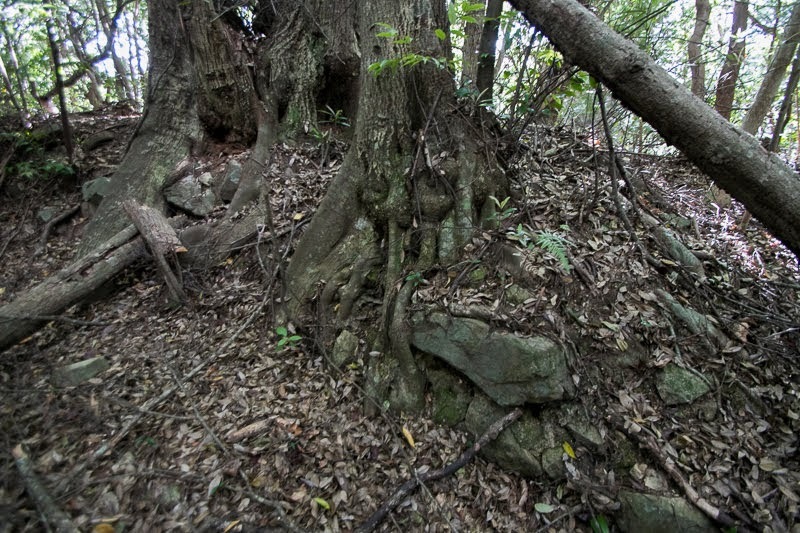 Motochika once captured most part of Shikoku island in 10 years, and Satake clan participated in these battles. 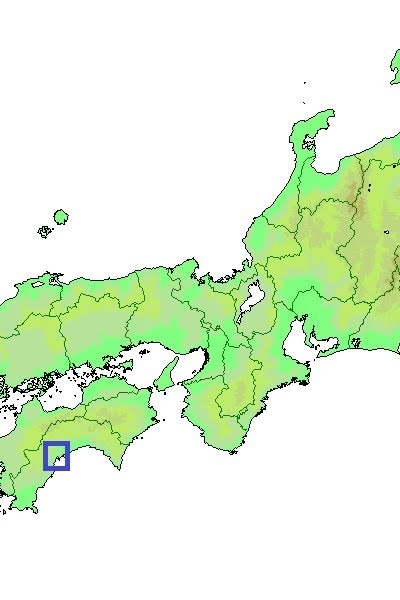 But in 1585, facing Shikoku campaign by central ruler Hideyoshi Toyotomi (1537-1598), Motochika surrendered to Hideyoshi and his territory was decreased only to Tosa province. 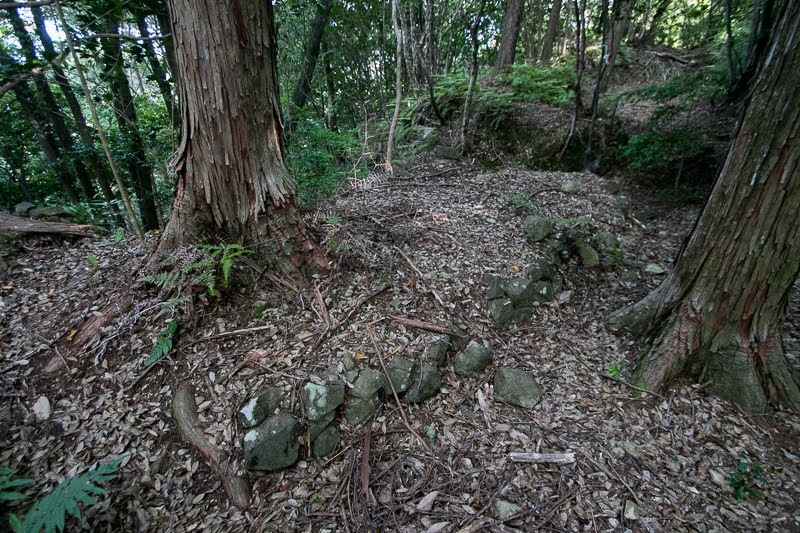 Next year, Hideyoshi ordered Motochika to support Otomo clan which was exposed to fierce attack of Shimazu clan, the warlord of Satsuma province (Kagoshima prefecture). 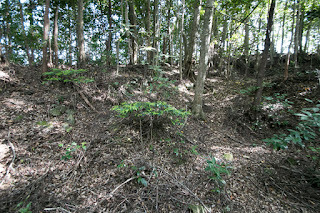 Toyotomi army lead by Hidehisa Sengoku (1552-1614) intercepted Shimazu army at the battle of Hetsugi-gawa but suffered fatal defeat, then the leader of Satake clan died in the battle along with Nobuchika Chosokabe (1565-1587), the eldest son of Motochika. 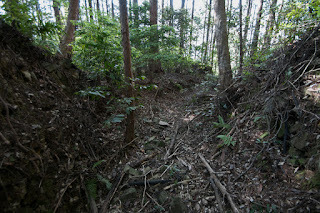 An internal conflict for successor occurred under disappointed Motochika, and after the death of Motochika in 1598, Chosokabe clan could not judge the situation well then reluctantly followed to Mitsunari Ishida (1560-1600) then lost the battle of Sekigahara without any action. After the battle Chosokabe clan lost Tosa province, and also Satake clan had to leave Kure castle. 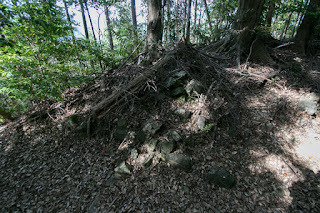 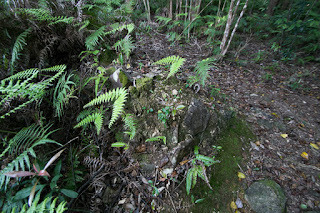 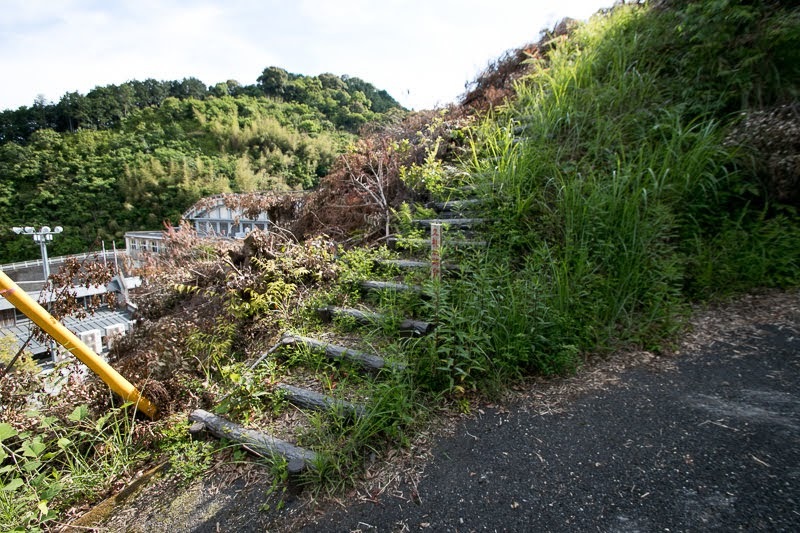 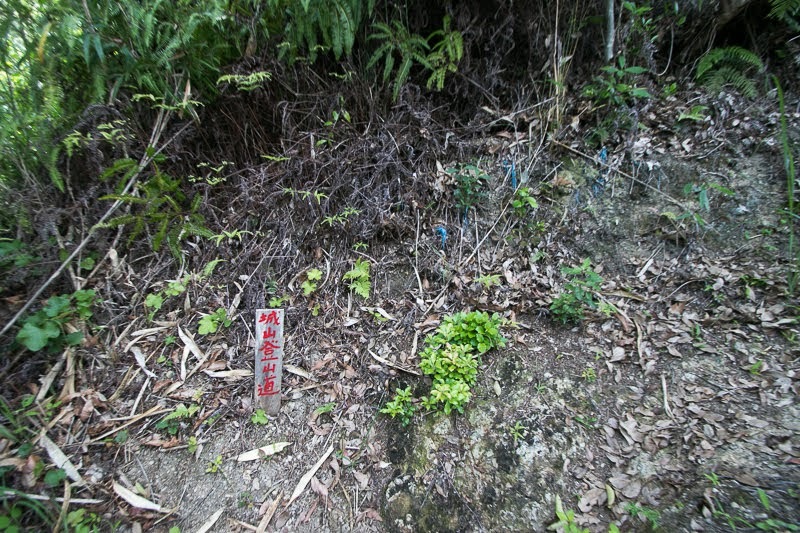 Kure castle might be abolished at this time. 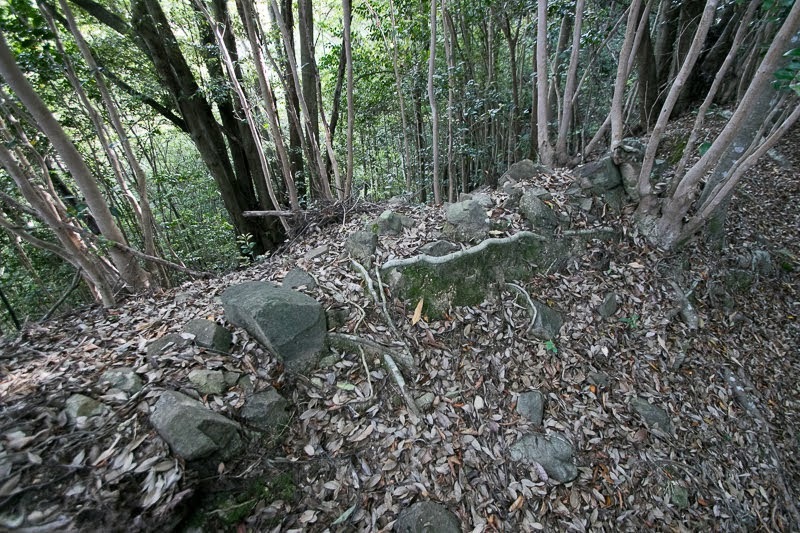 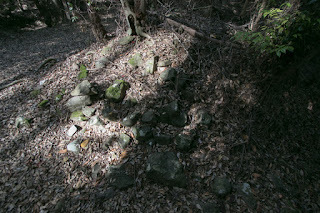 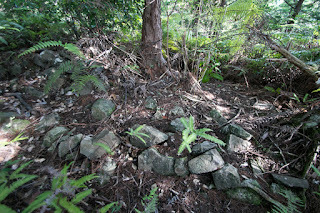 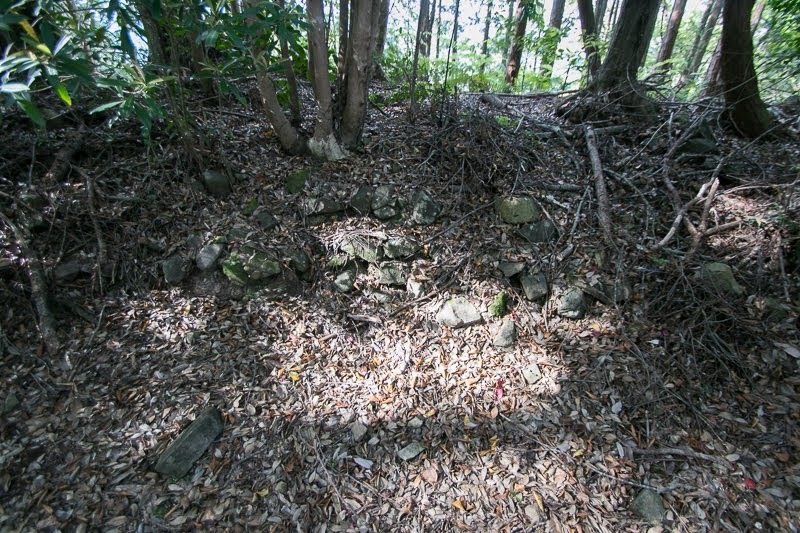 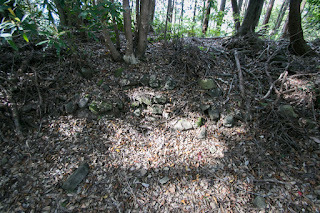 Today no building was left but structure of the castle well remain over the hill, except for the residence of the lord and front side fort destructed by the construction of schools. 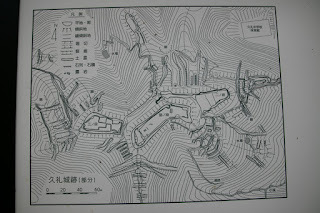 Combination of numerous moats shows original castle construction style of Chosokabe clan, which was lost at their main base Oko castle by the modification to central style. 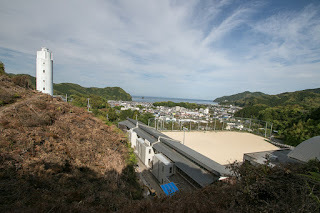 It also shows the young days of Motochika Chosokabe, vital and crafty pushing forward to the unite of Tosa province and Shikoku island. 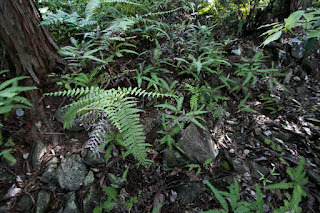 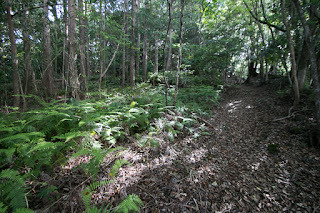 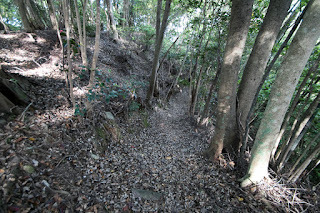 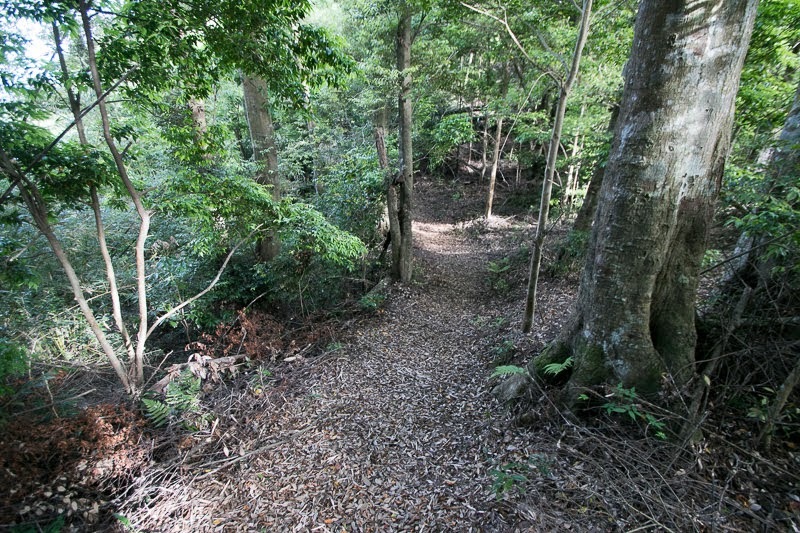 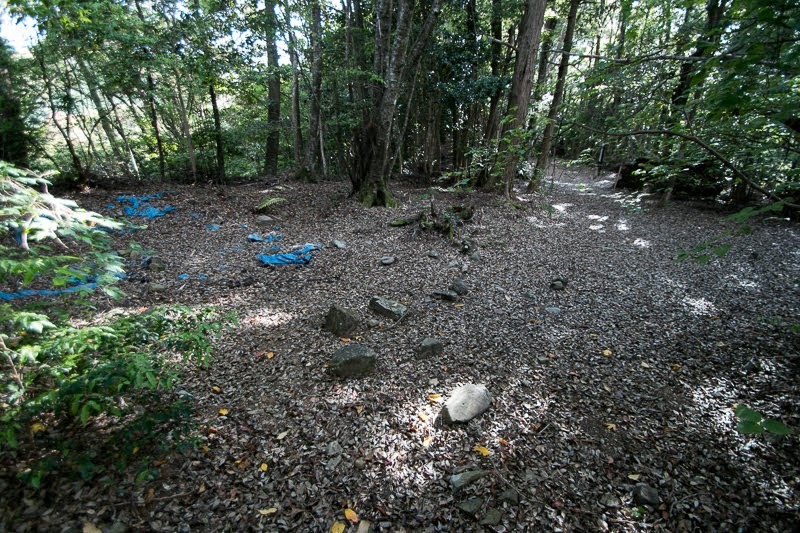 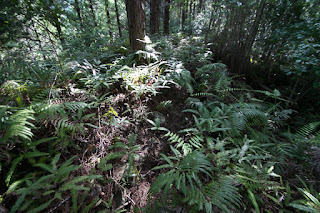 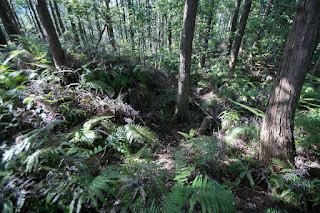 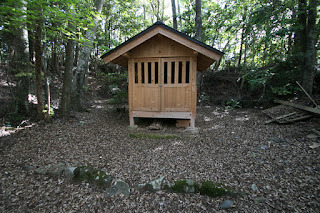 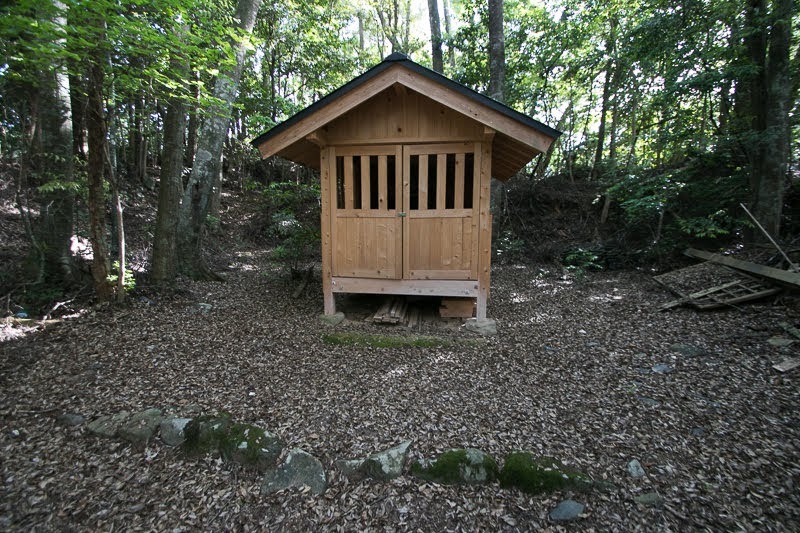 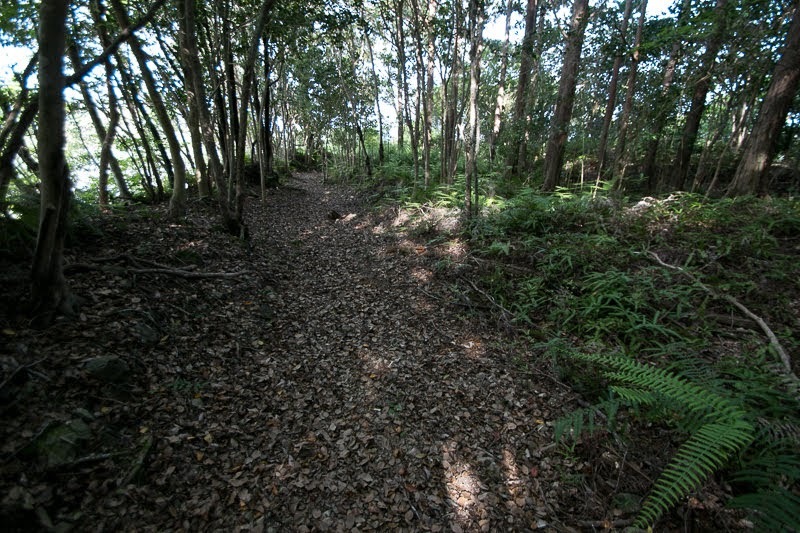 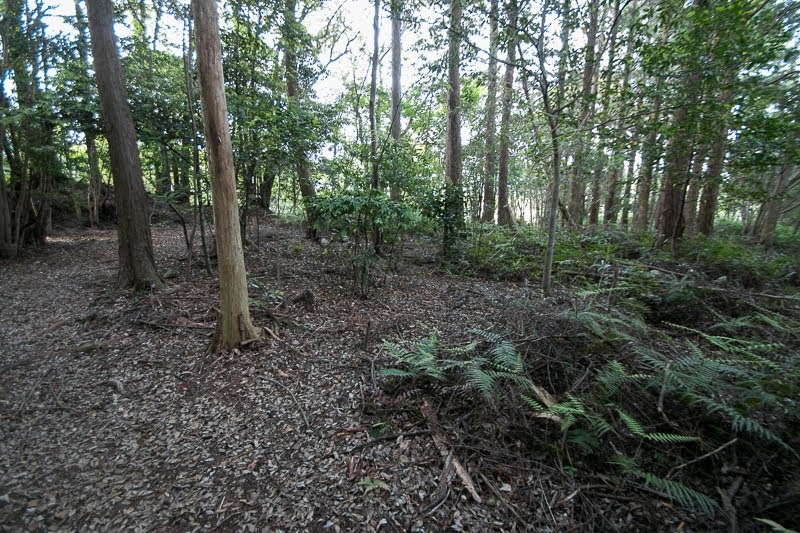 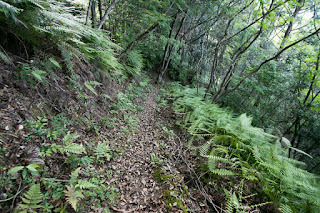 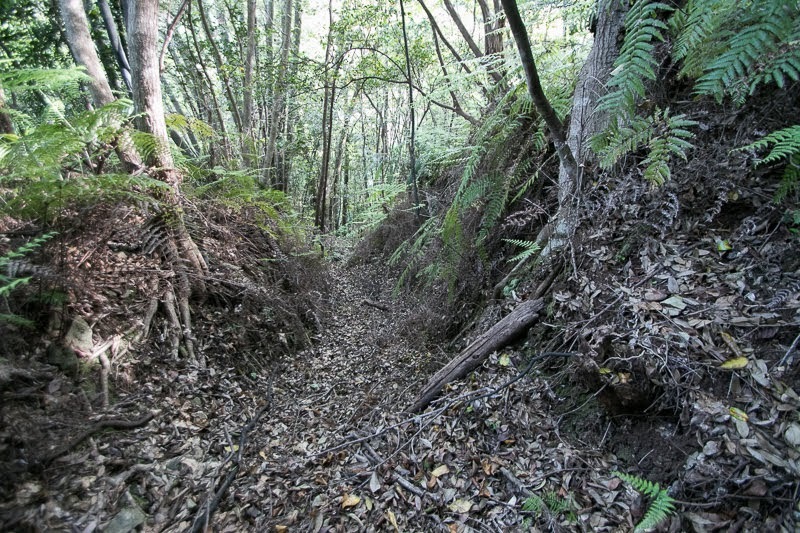 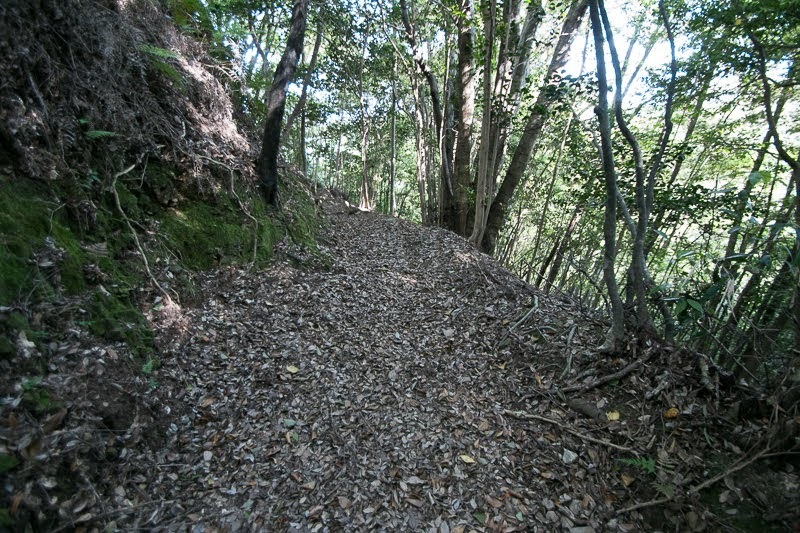 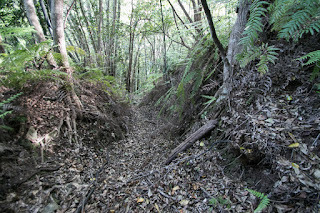 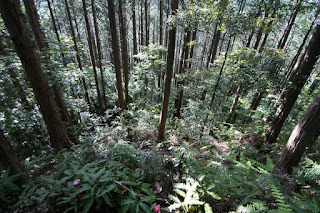 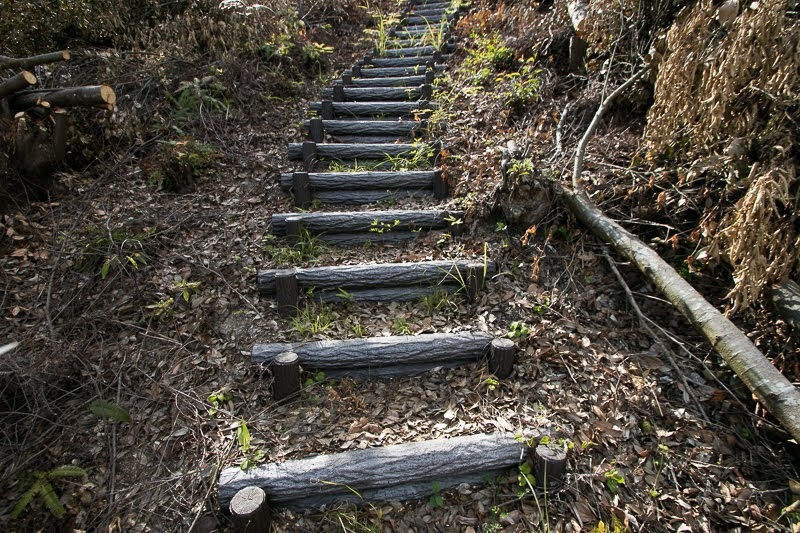 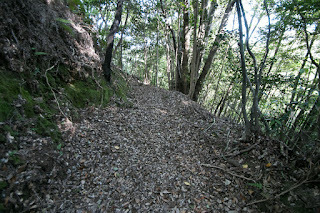 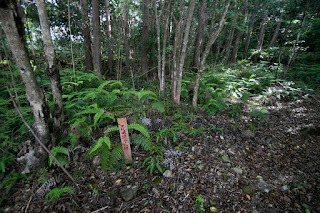 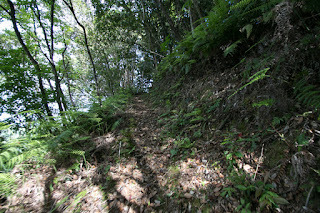 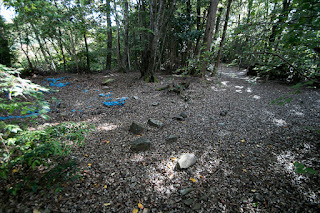 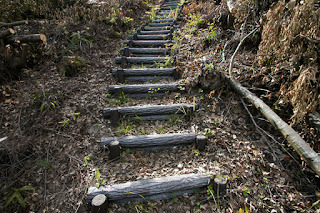 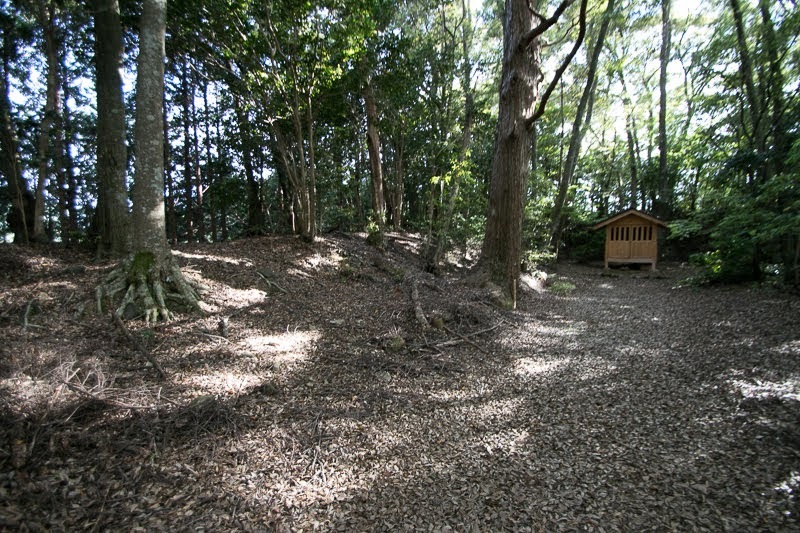 20 minutes walk from JR Shikoku Dosan-sen line Tosa-Kure station. 10 minutes drive from Kochi-Jidoshado Expressway Nakatosa interchange.